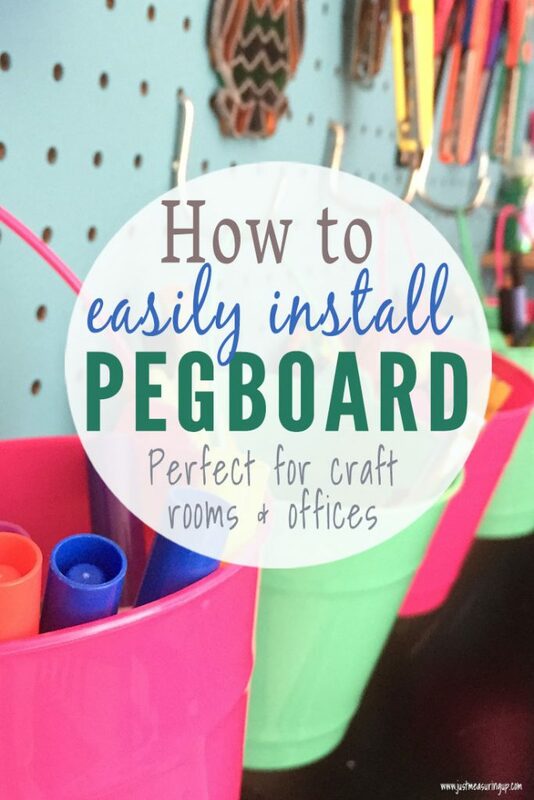 How to Install Giant Pegboard for Craft Room Organization: In this post, you’ll learn how to install an oversized pegboard organizer on your wall. 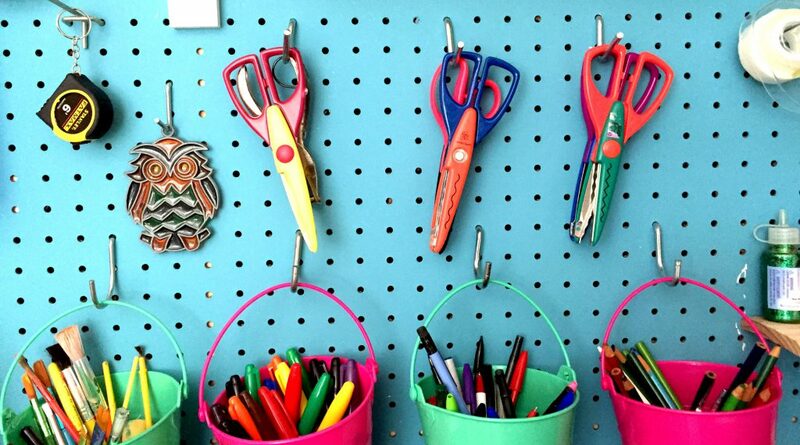 This DIY pegboard display is perfect for craft room, office, or even kitchen organization. Anything you could ever want, for any project, resides in Eileen’s craft room. Ribbon, paint, pipe cleaners, card stock, felt, sewing materials, hot glue. Not to mention all of the kids crafts and holiday materials. 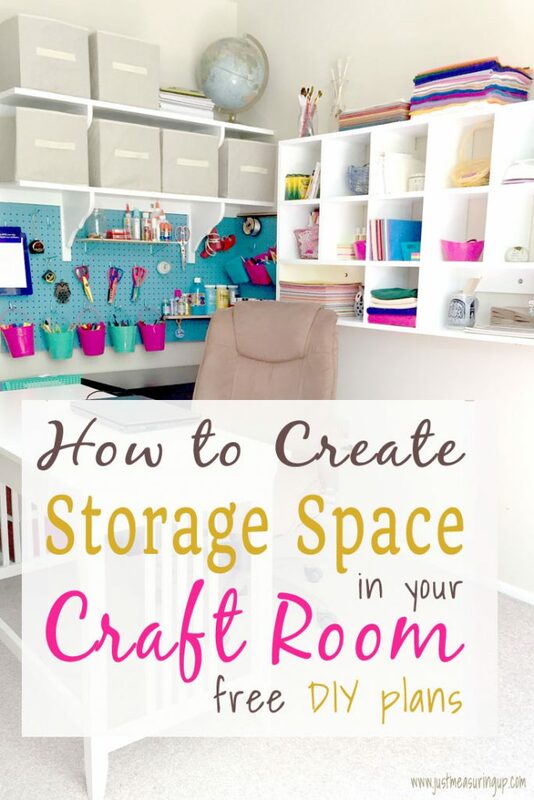 However, there was no room for any kind of craft room organization and storage. I usually found Eileen behind a mountain of fabric or sitting amidst a pile of felt scraps. The closet was packed with those plastic drawer organizers filled to the brim. With hopes to organize, and perhaps even empty the closet, Eileen wanted to add storage to the walls. It was a great idea because there was tons of wall space that was barely being utilized. She had her office desk and computer in that corner, so she envisioned being able to spin around in her chair and easily access any of her materials. 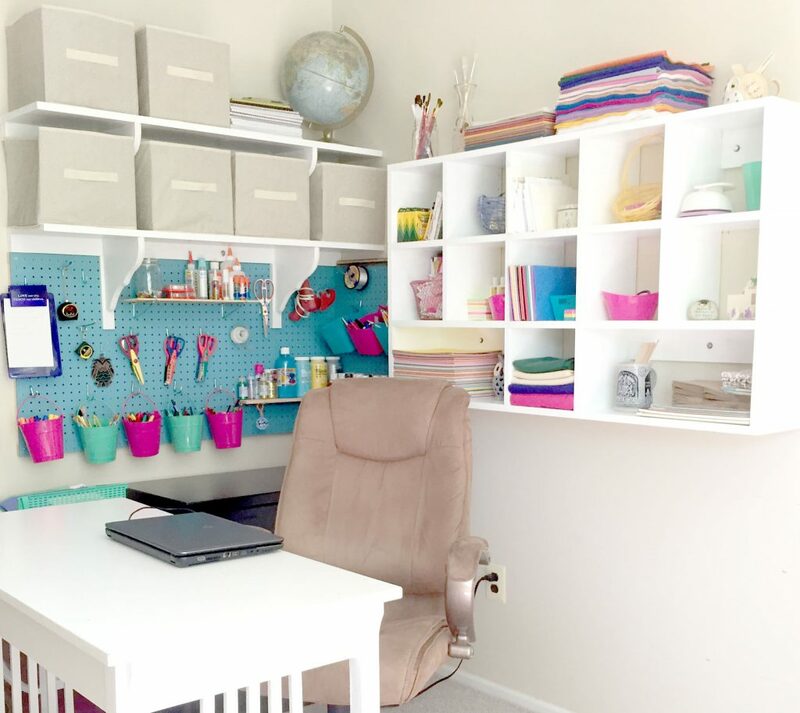 Her craft room organization and storage vision included a giant pegboard, shelving, and wall-mounted cubby storage. 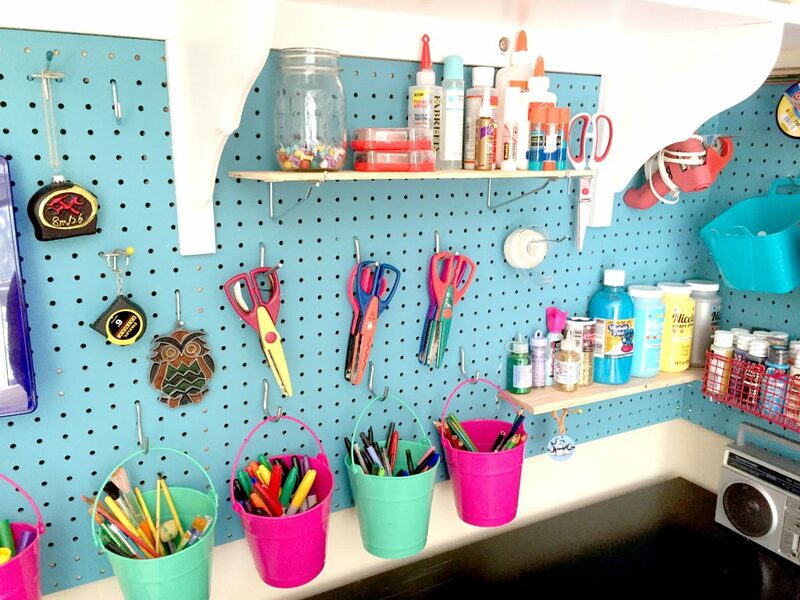 In designing a plan, Eileen was thinking that she would have oversized pegboard continue into the corner, using hooks and mini shelves to hang up craft supplies that she used a lot – scissors, tape, paints, brushes, etc. Then, above that she would have two long shelves that would hold a bunch of fabric storage bins. She also has a large supply of those fabric storage bins, as they are all over our house. She keeps holiday decorations in them, learning activities for our son, party supplies, and a lot more. The more bins she could fit on these shelves, the better. Last, and the part she was most excited about was the wall-mounted cubby storage. These would be little cubbies that could hold all kinds of things – bins of felt scraps, stacks of card stock, envelopes, and little bins of office supplies. Time for me to get to work on a design for all of this craft room organization and storage. The black box is the filing cabinet. The aqua panels on the wall are the diy pegboard display. The semi transparent block in the center represents the dimensions of Eileen’s desk chair. The craft room organization and storage project was going to be fairly easily to get done. The pegboard and shelving was straight forward. 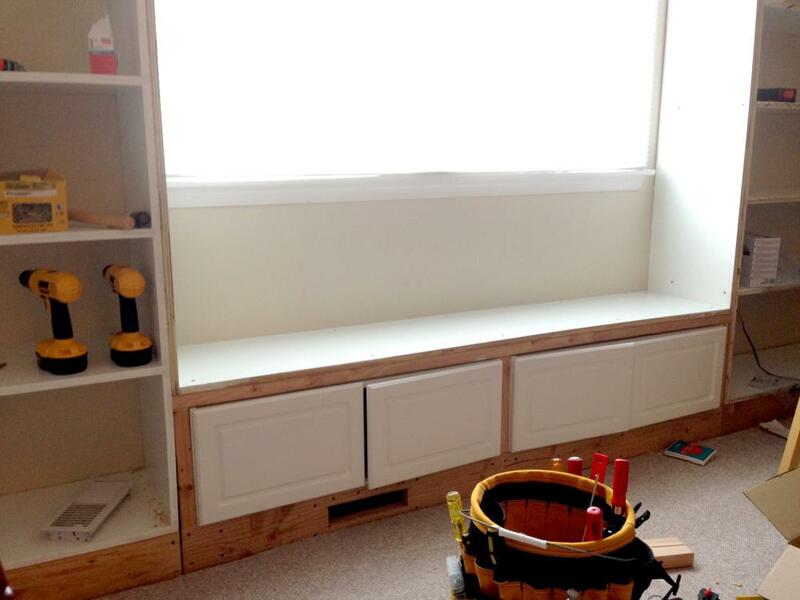 The only slightly challenging piece was the cubby storage. I had never made cubbies before, but it didn’t seem too hard. And, here was the final result. 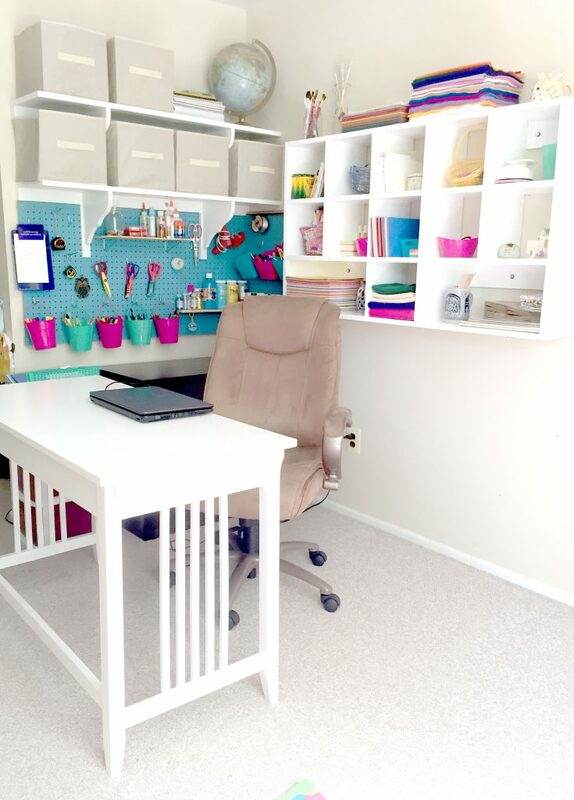 The craft room organization and storage project truly turned a messy, wasted corner of space into a craft room dream. All of this craft room organization and storage completely emptied 5 bins/dressers/plastic storage containers worth of materials. Crazy, right?! 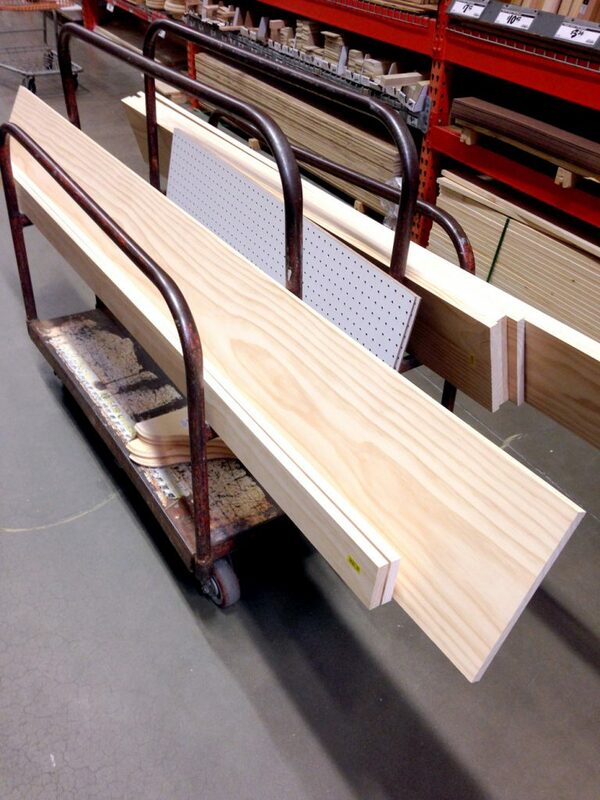 To embark on this craft corner storage and organization project, I started off with a quick trip to Home Depot. 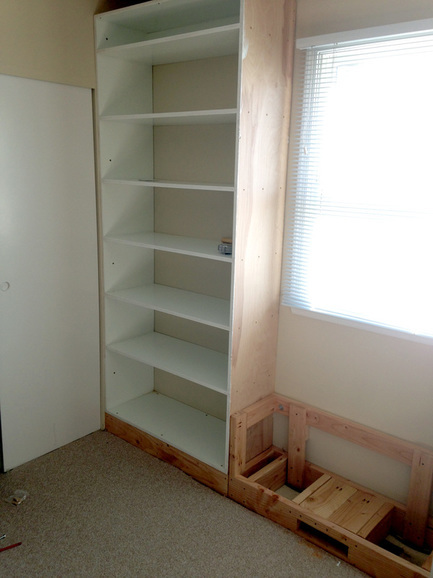 The craft room organization and storage DIY project was very modular. There were three unique pieces (giant pegboard, shelving and cubbies) that could be worked on and installed independent of each other. 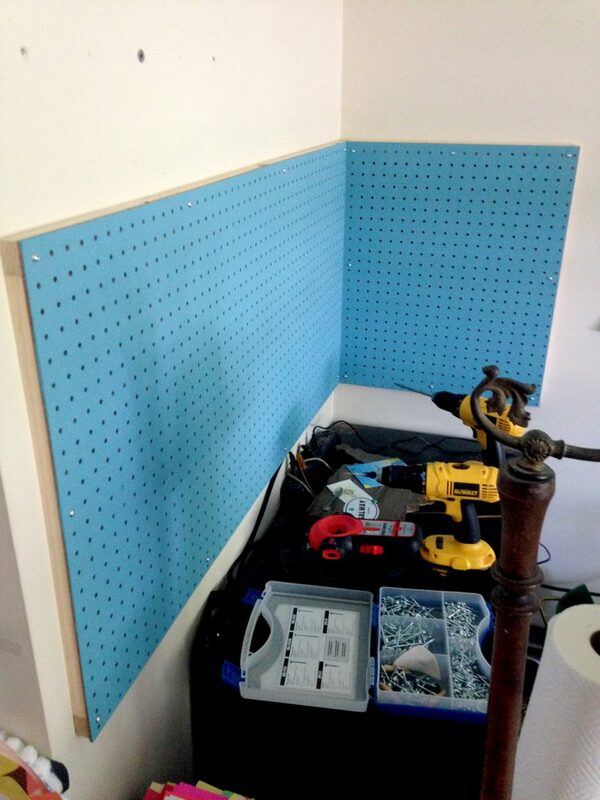 In this post, I’ll cover how to install the giant pegboard. I chose to work on the pegboard panels first. They were the simplest to get done. 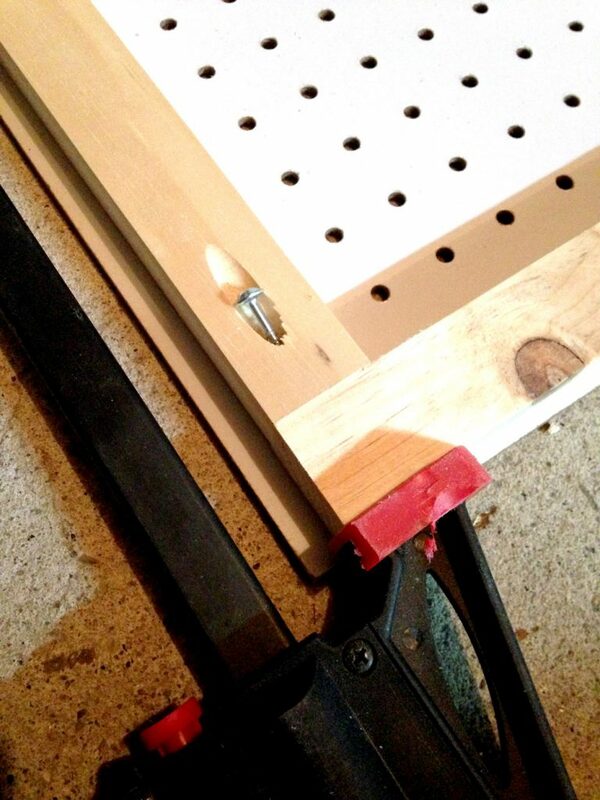 The store-bought pegboard needs a backing frame to ensure there’s enough space for pegboard hooks to be inserted. Most people usually use furring strips for the frame. Since I didn’t have any, I started by cutting some 1” backing strips from scrap wood with my table saw. Here’s the framing coming together. 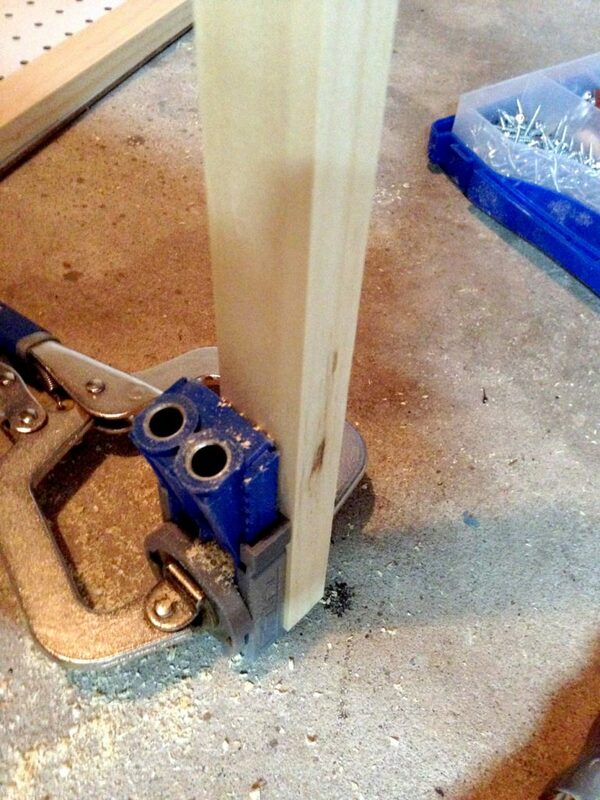 When the pegboard frame was completed, I secured it to some wall studs using deck screws. I later built another smaller frame on the right to make the pegboard paneling hug the corner. 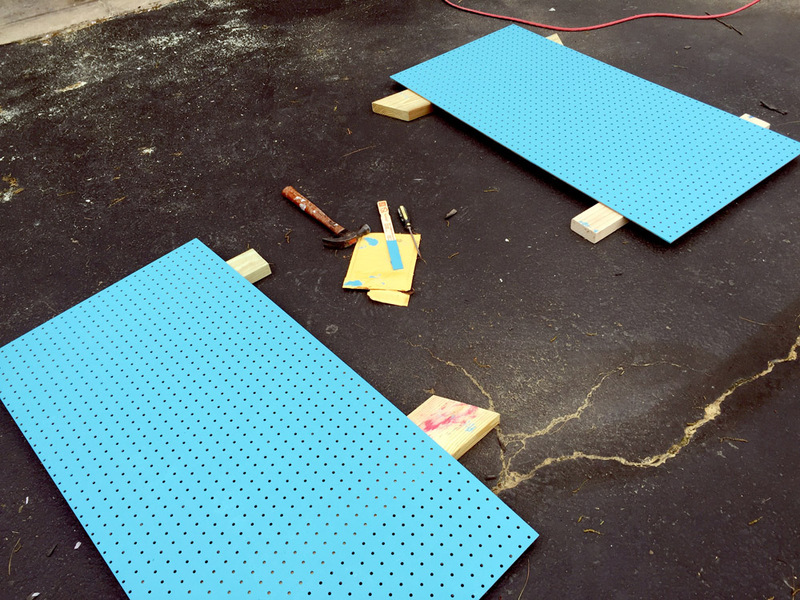 Prior to rolling on the paint they picked, I laid out the pegboard on some 2x4s in the driveway. Then I rolled on two coats of paint. To secure the giant pegboard to the frame, I used pocket hole screws. They were perfect because they had built in washers and would prevent the pegboard from ripping through the screw heads under load. The first part of the craft room organization and storage project was checked off my list. Below is a picture of how Eileen organized it all. The craft room pegboard completely emptied out her plastic desk organizer and more. On the pegboard, Eileen used a collection of various pegboard hooks that I had, as well as some awesome little plastic buckets from Dollar Tree (3 for a $1). I did order some fancy pegboard organizers from Amazon, but I kept them for my own pegboard since she was happy with her organizational system. 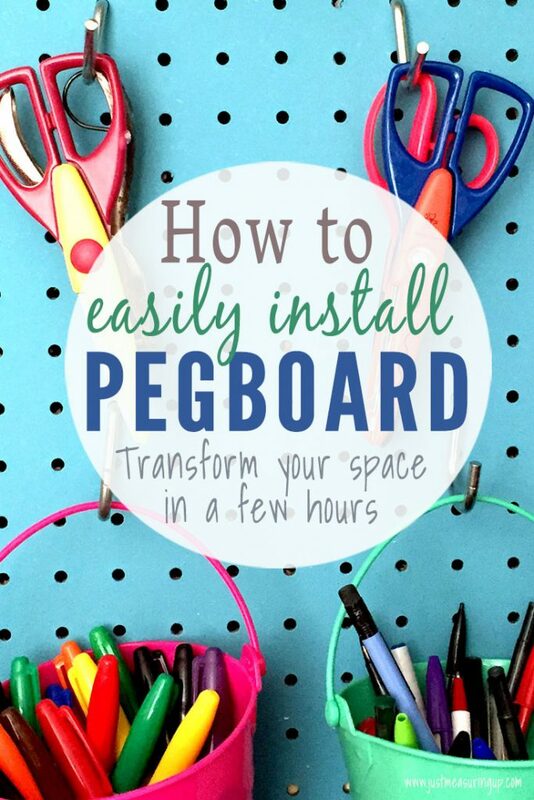 I have to admit – I have already benefited from the pegboard organization. When making a few measurements upstairs, I easily grabbed her measuring tape. The scissors are found easily without digging through a drawer – and I just used the fishing line to make a kite with our son – without having to ask for where they were or dig through storage containers. 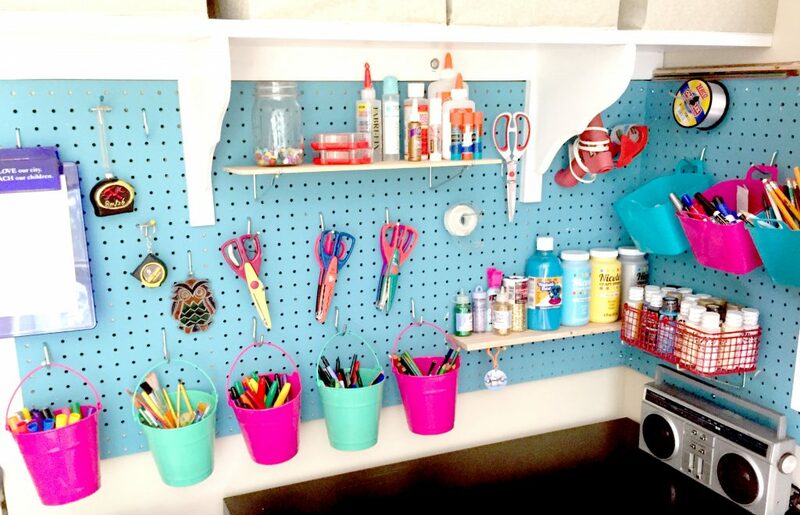 Here is the final craft corner – with the pegboard, the DIY cubby shelf, and the wall shelves. With the amount of new storage created, Eileen was able to empty out tons of storage containers. She emptied three storage towers, one cart, and one dresser. She completed underestimated the amount of space all of the new craft room storage gave her. 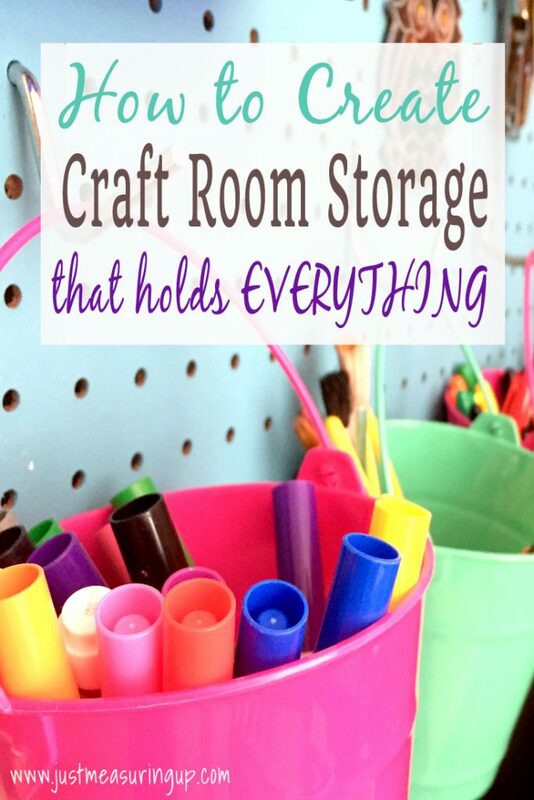 Don’t forget to download our free plans for this craft room organization and storage project. 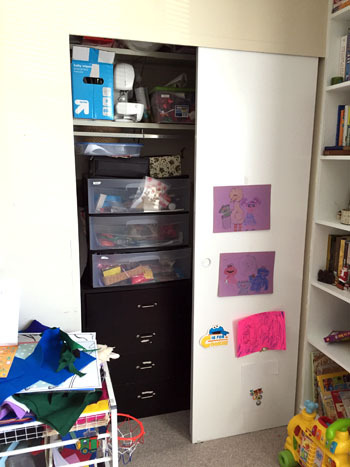 The new craft room storage made a huge impact in Eileen’s craft room and office. She emptied out so much space in the closet, which can now be a linen closet. All of that wall space that was wasted before was now holding an incredible amount of craft and office supplies. Her craft room organization and storage problem was solved. And, all of her craft materials were easily accessible, rather than shoved in bins and bins in the closet. 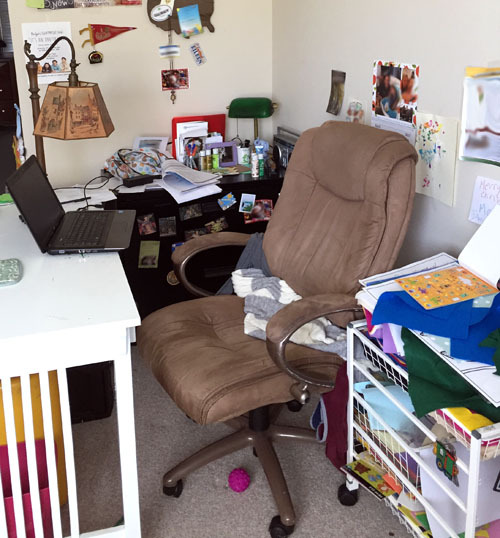 Eileen’s craft room and office is her absolute favorite place in our home, as she has floor-to-ceiling bookshelves with a window seat on one side and a highly organized craft corner on the other side. It’s truly her dream room. It was well worth the time and investment. 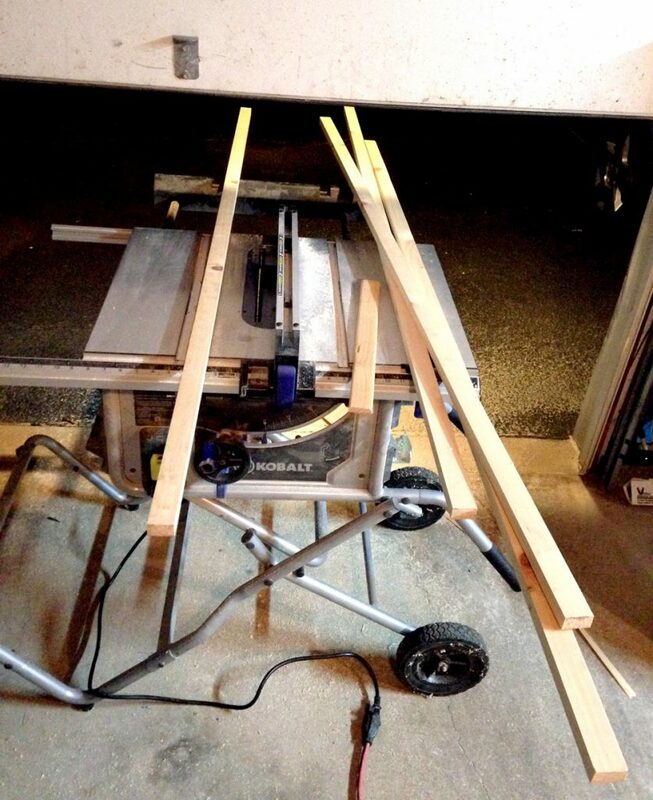 With my garage getting a little disorganized again, I’ve been working on building rolling worktables. As I was working on the custom-built drawers, and thought I would share my process. 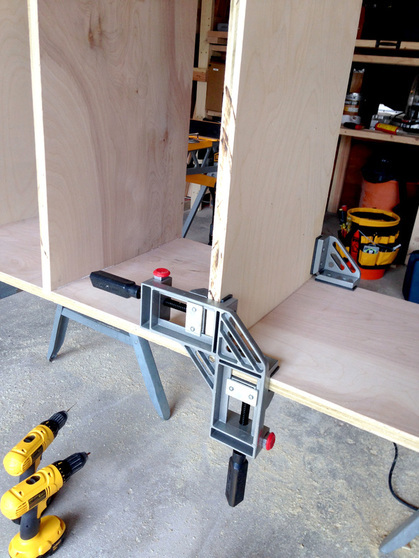 At some point as a DIYer, you might come across the need to make some drawers yourself – and it’s really rather simple. 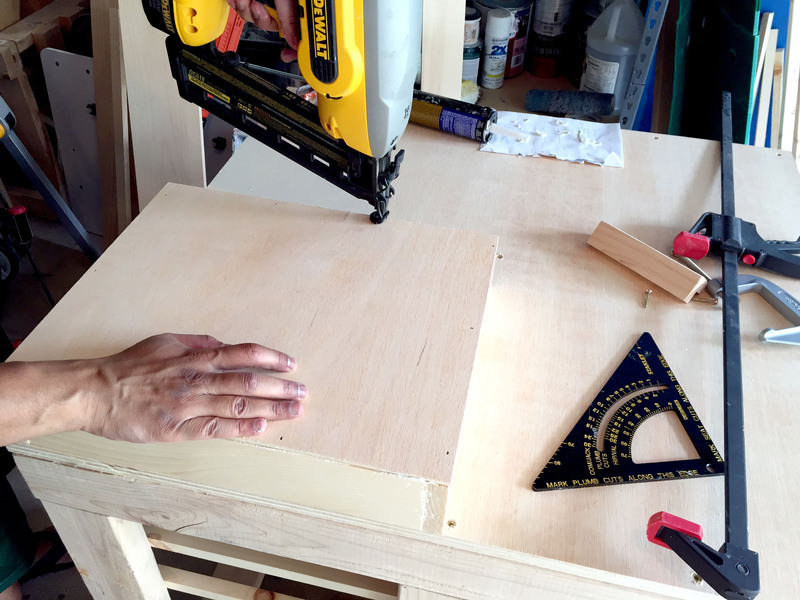 If you are wondering how to make DIY drawers, there are many ways you can do it. In the end, it’s just a rectangular box with a floor and a handle. 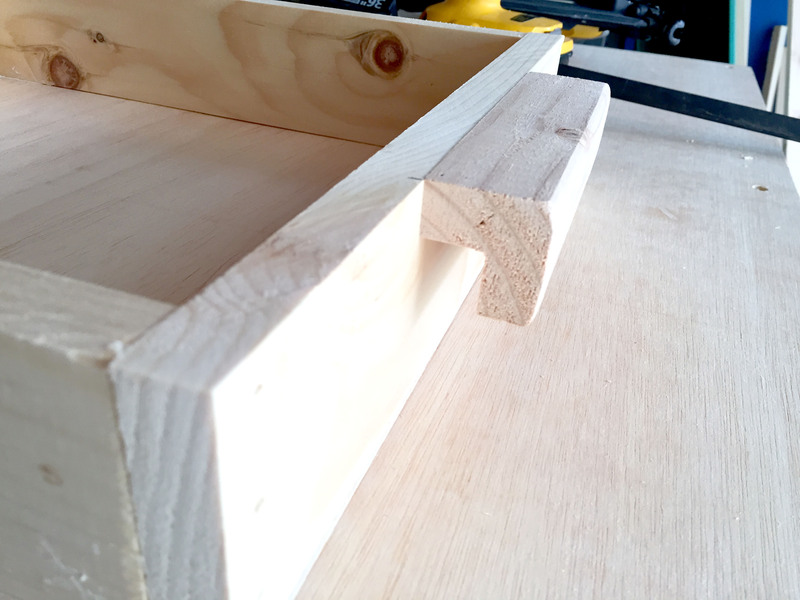 Among the many techniques out there to accomplish this, the three top methods that come to mind are dovetail joints, pocket holes and construction adhesive with nails. The glue and nail technique has come to be my favorite. It’s super simple and very strong. Basically, I cut the four box sides (usually ¾” boards), apply construction adhesive to the ends, and secure in place with finishing nails. Then I use more glue and nails for a ¼” plywood bottom. I have actually built a number of generic boxes in the past with this method, but hung them on the wall with French cleats (see my project about finding hidden storage in your garage). 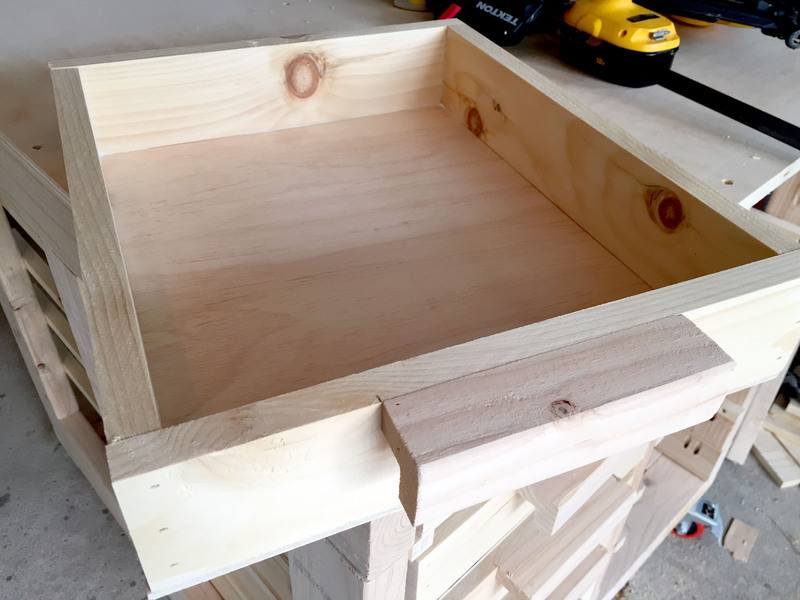 Turning one of these basic boxes into a drawer just requires a handle, and possibly some sliding hardware, depending on how you are going to use the drawer. Some drawer designs also benefit from a decorative faceplate. The faceplate will additionally hide any visible joints made from the box design. I outline all of the steps that I took in this tutorial on how to make DIY drawers, but if you would like to see a video walkthrough, here is one which shows the whole DIY drawer-making process. I happen to own a 16 gauge finishing nail gun, so drawer construction with glue and nails is extremely fast for me. However, I started off with just nails and a hammer and got the job done just as well (albeit a little more time taken). If you have the budget for a finishing nail gun though, you should seriously consider getting one for your DIY projects. Target the 16 gauge ones though. I think they are the most versatile. Higher gauge ones are really only practical for applying trim. Lower gauge ones similarly also limit the scope of projects you can work on. I find that 16 gauge strikes a fine balance between the two ends of the gauge spectrum. I use it to install most types of trim, while being able to quickly prototype ideas and fabricate projects. So unless you’re a professional contractor who needs all the different gauge guns, as a DIYer you can compromise with a single 16 gauge gun. 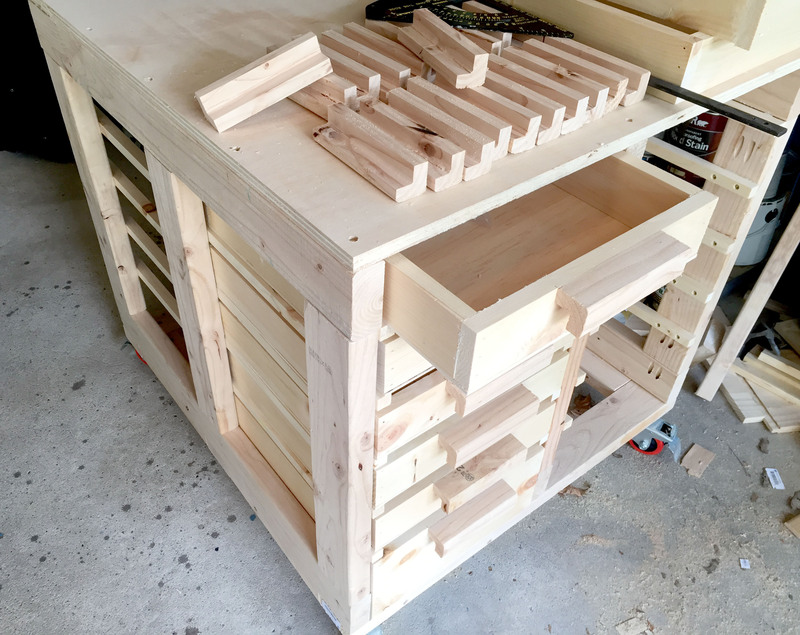 The current garage storage project requires me to make a lot of drawers. The key to getting it all done is efficiency. On my workspace, I just have the minimum amount of tools necessary to get the job completed. With my setup, I can bang out a drawer in under 10 minutes. The wood is then pressed together to form the box design. I use the square edge on the inside of the corners to make sure the angles are 90 degrees. Then I use the bar clamp to hold everything firmly in place. It’s useful to keep some paper towels handy as the wood glue with squeeze out the sides of the joints and get messy. I also like wearing plastic disposable gloves so my hands don’t get covered in glue. My drawer height is about 3” for this particular project, so 3 nails at each joint would suffice. Deeper drawers will require more nails spaced out evenly. You don’t need to go crazy with the nails though. Contrary to what you may think, a majority of this drawer strength comes from the construction adhesive and not the nails. The nails do add some strength, but are mostly there to hold the drawer pieces tightly in place while the adhesive dries. Here’s a word of caution if using the nail gun. 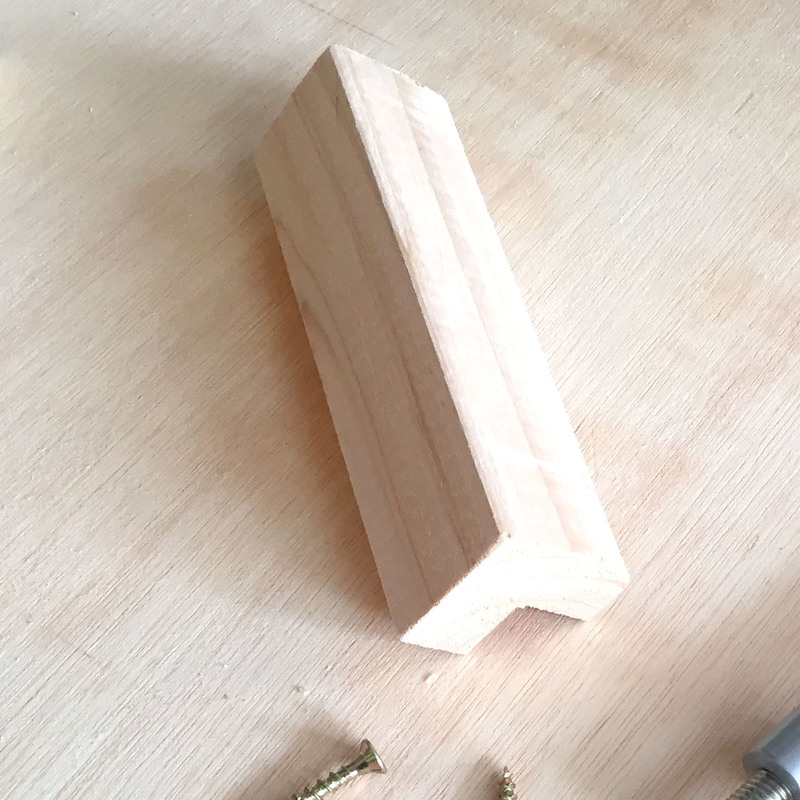 If you’re relatively new to them, you may want to practice on some scrap wood first before shooting some nails into your drawers. 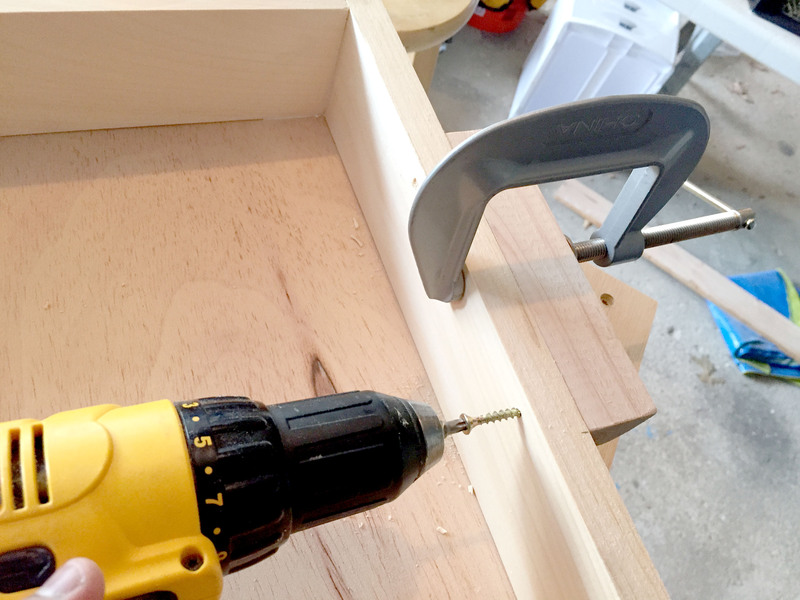 With ¾” drawer sides, you don’t have too much room for error and will need to fire the nails as straight as possible. This may just come with experience, so practice makes perfect. Even I still fire some nails accidentally at a slight angle and the nail ends up protruding out the side. When this happens, it’s annoying because you will have to either break off the protruding end or pull it out completely. Then decide if you need to fire a replacement nail. Note that if your wood is too hard, or if you’re firing into knots, your nails can still poke out the sides, regardless of how perfectly straight you fired it. If this is the case, you can just use a hammer and nails (or reconsider the gauge of your nail gun). Be careful what side of the drawer you decide to install the floor on. 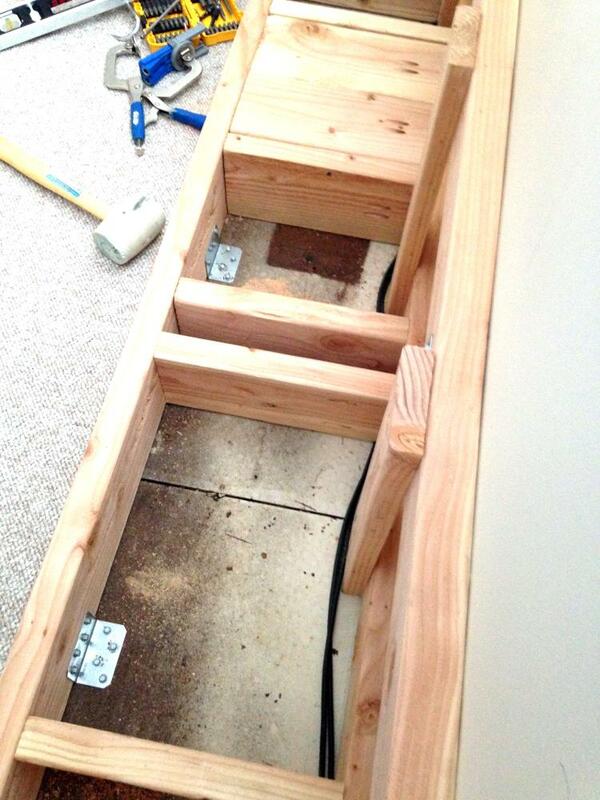 You want to use the side that’s perfectly flat so the floor is flush against the drawer. If your ¾” boards aren’t all exactly the same heights, then one side of the drawer will not be all flat. Ensure you’re using the flattest side my flipping the drawer over and using the side that was resting against your flat workspace. 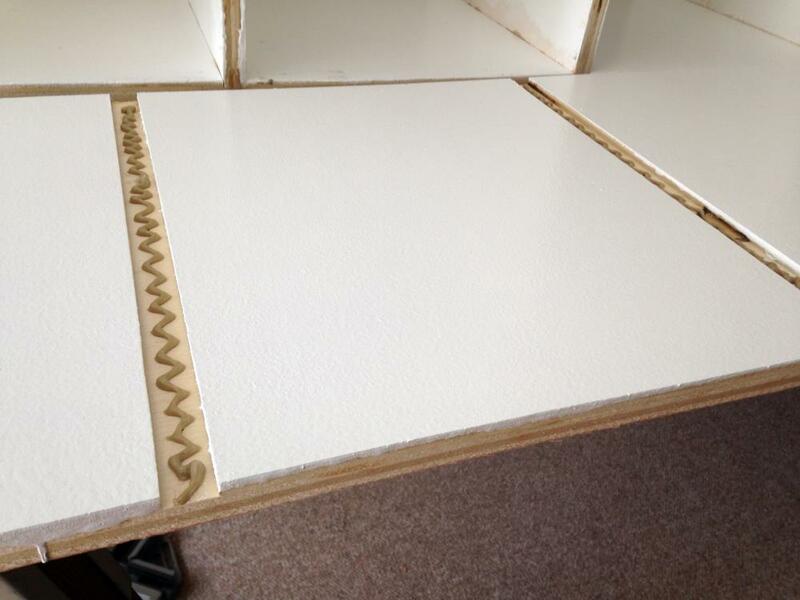 Once the glue is applied, press the plywood floor firmly against the box and use your fingers to align the edges. Then fire some nails to finish it off. I usually nail the corners first, and then put in some evenly spaced ones along the box perimeter. 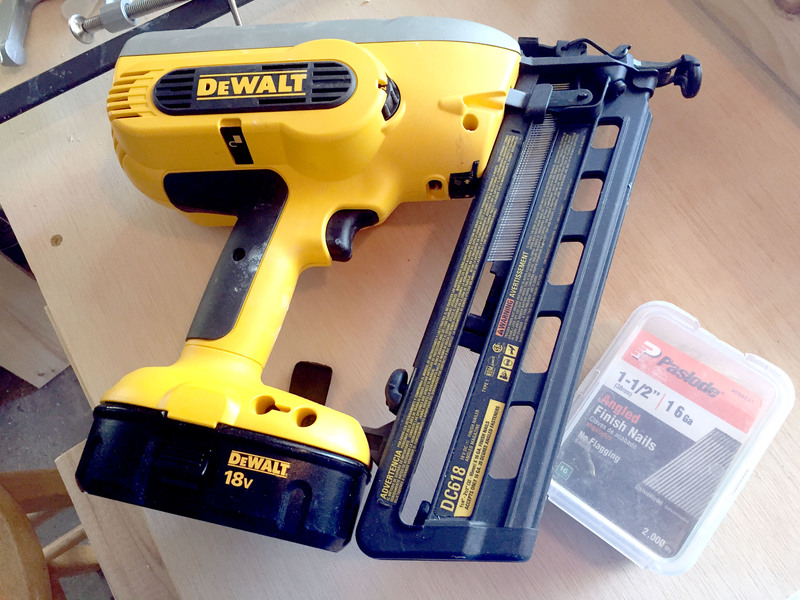 If your nail gun has a depth setting, you will want to use a fairly low setting for the drawer floor. 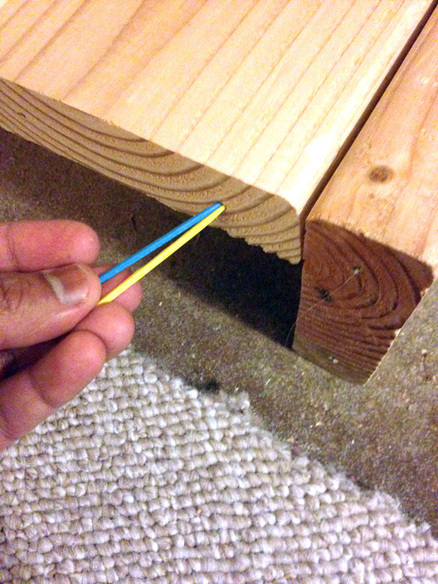 Since it’s only ¼” plywood, you risk firing the nail all the way through if using too deep of a nail depth. Finally, try your best again to fire the nails as straight as possible (or else you’ll be pulling out those nails that poke out the sides). Now for the handles. If you aren’t going to make that many drawers, you can just purchase them at the store. However, if you’re working on a large project requiring lots of drawers, you can pocket some nice savings by making your own handles. There is a lot of handle design inspiration out there on the internet. Personally, I prefer a super simple L shaped handle cut from 2x4s with my table saw. A single 8ft piece of 2×4 will yield around 30 six inch handles. With the garage storage project I’m working on, I need 48 handles. My homemade handle costed around 15 cent to make. Considering handles in the store cost a couple dollars, that’s some significant savings! To make the handles, I rip a piece of 2×4 down the middle with the table saw, dividing it into roughly 2x2s. Then I set the cut length and depth to ¾” and again rip the 2x2s lengthwise. This cut a slot halfway into the wood. Rotating the wood 90 degrees and ripping again made a perpendicular cut to the first slot. The notched wood fell out leaving an L shaped piece. Then I just used a miter saw to quickly cut the 8ft piece into smaller 6 inch pieces. The best part of using 2x4s for the handle is that the edges are already bevelled for you. No need for sanding or special routing to create smooth edges. 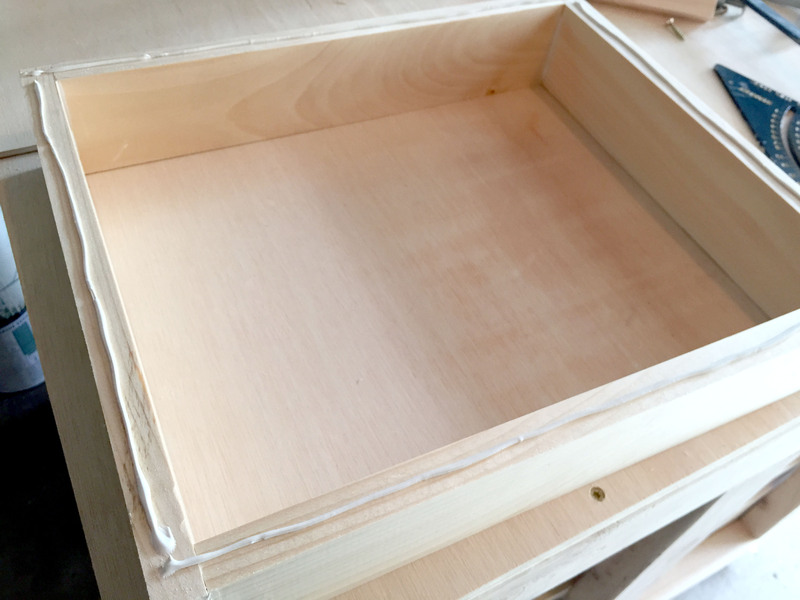 With the drawer box completed, you have some options as what to do next. You could just leave the box as is and call it a day. After all, it’s a nice sturdy box with limitless potential. Depending on your project, you may want to install a faceplate on the front, and possibly some sliding hardware. Then comes the final task of attaching a handle. For my current project, I didn’t need a fancy faceplate or even sliding hardware. So I jumped straight ahead to attaching the handle. For handle installation, I measured and marked an offset so the handle would be perfectly centered. Then I used a C clamp to hold the handle firmly in place while I pre-drilled some holes and inserted two screws. I didn’t use wood glue for the handle. I definitely could have, but the screws already make a very sturdy connection. Plus, I like to leave handles flexible in case I want to replace them in the future. Glue would make this difficult. With a nail gun, these drawers should take under 1o minutes to make. If you’re using nails and a hammer, then add on a few extra minutes. These drawers are also very cheap to make. If you have some scrap wood, then they are free! If not, then I estimate around $2 per drawer (assuming you buy some wood in bulk to make a batch of drawers). Also, if purchasing wood, I recommend maximizing the yield of drawer cuts as much as possible. This will give you be lowest prices per drawer. 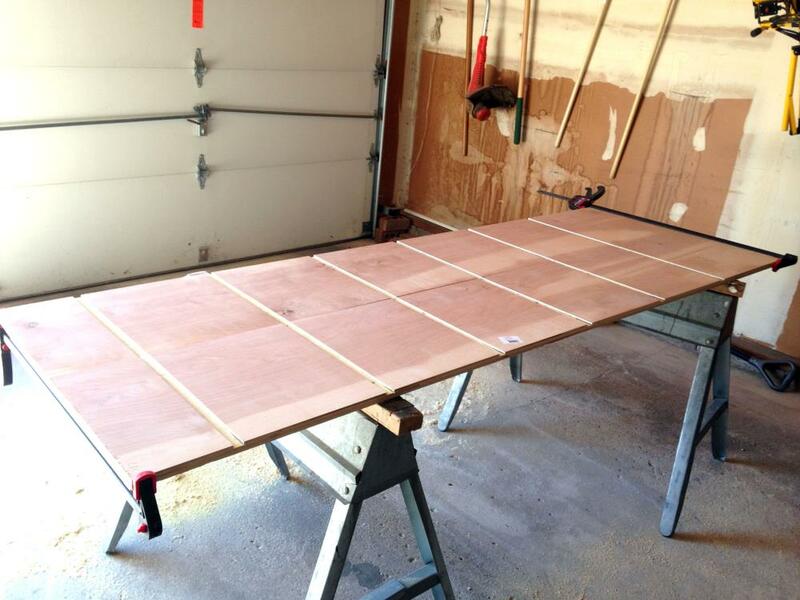 For example, I purchased some 4×8 sheets of 1/4″ plywood from Home Depot (to make the drawer bottoms). To keep costs as low as possible, I calculated ahead of time how many drawer bottoms I could possibly fit on the 4×8 sheet. Then I factored in how I can get the 4×8 sheet cut at Home Depot to fit in my SUV (it was too large to transport whole sheet intact). In the end, I was able to provide Home Depot with some simple cutting measurements and still maximize the yield of drawer bottoms from the 4×8 sheets. 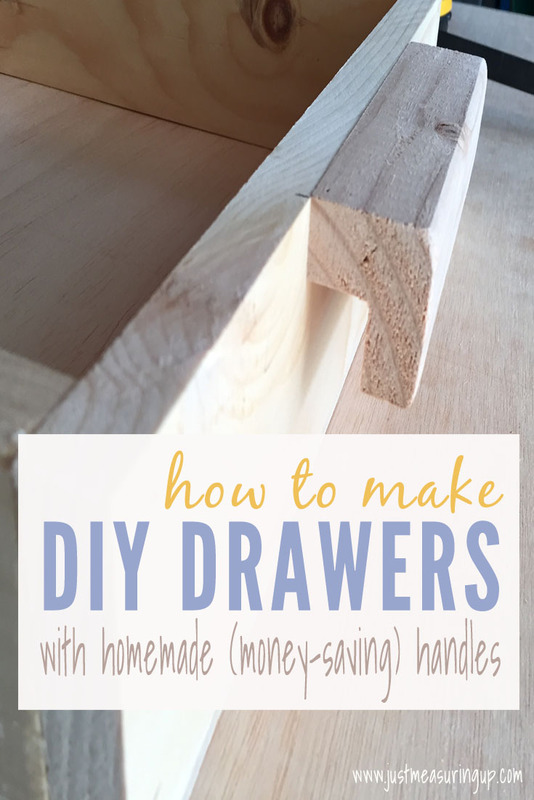 If you have been thinking about how to make DIY drawers, just follow these easy tutorial and you’ll have your homemade drawers ready to go in no time. I’m so pleased with the way the DIY drawers turned out. I also love how much money I saved on craftily creating my own handles. 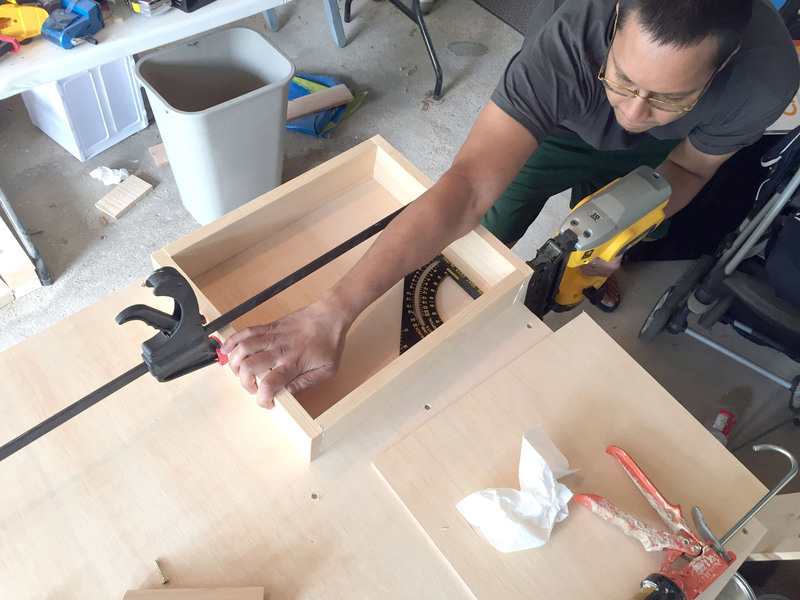 Check back soon for my garage storage project – which will show these DIY drawers in action. Using a decades old nightstand with many stains and uneven surfaces, the chalk paint exceeded my expectations, totally transforming the desolate nightstand into a modern piece, without any sanding or priming. ​I was sold on chalk paint, and I’m sure you will be too after reading through this chalk paint tutorial. Before I give you the step-by-step instructions on using chalk paint, here are a few pictures of the piece before the chalk paint. You can see the uneven surfaces and scratches, especially on the lower part of the shelf. 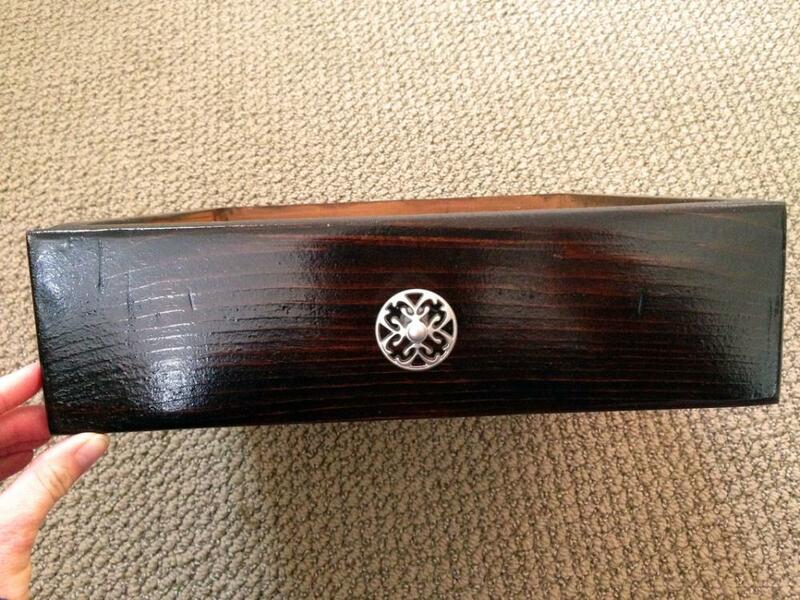 And this is a close-up of the top of the nightstand before using chalk paint. 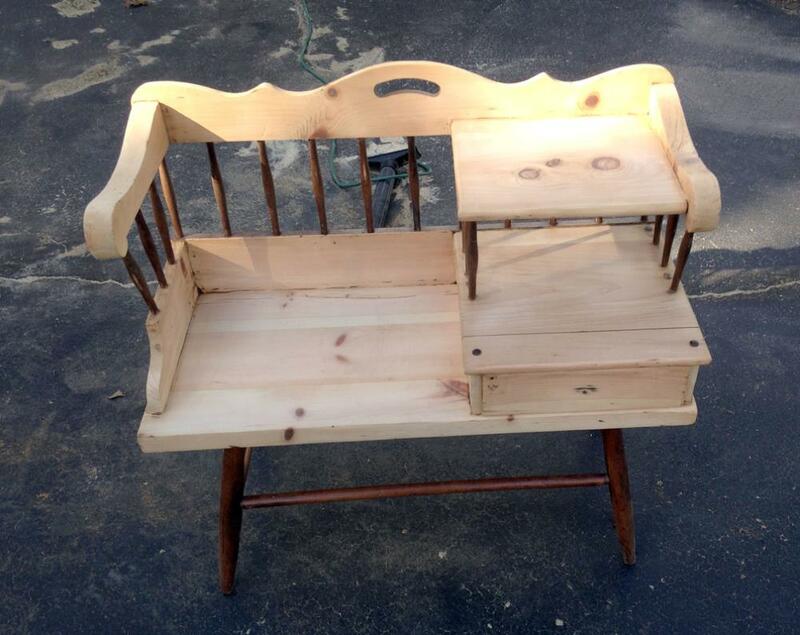 It wasn’t in good shape at all – but the chalk paint covered it all perfectly without any sanding. The first step in the chalk paint process was deciding what brand chalk paint to use. I used Annie Sloan Chalk Paint. I went back and forth deciding whether to use Annie Sloan or another brand. Since I was split down the middle, I ultimately decided to use Annie Sloan because of the chemical warning I saw written on the wax container of the other brand of chalk paint – in comparison to the natural ingredients used in the Annie Sloan wax (like beeswax). 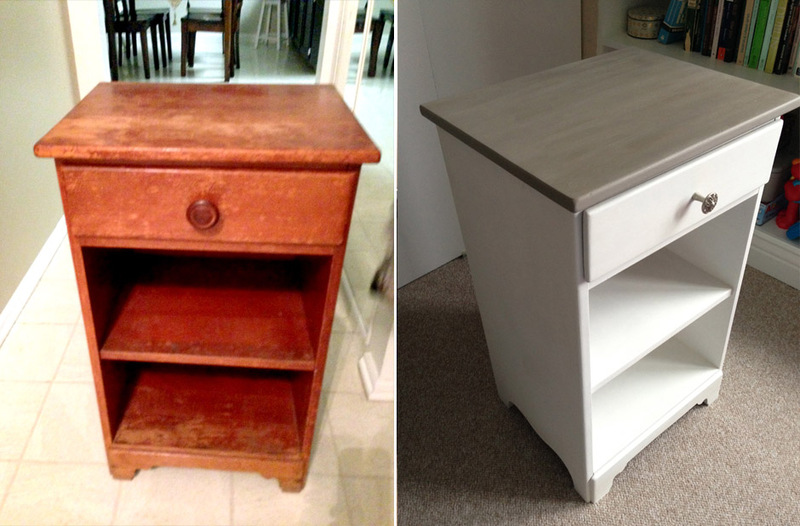 That, coupled with the fact that it was my first chalk paint project, sold me on the Annie Sloan brand. For the top of the nightstand, I used primarily French Linen chalk paint from Annie Sloan (keep reading for how I made it look like distressed wood). 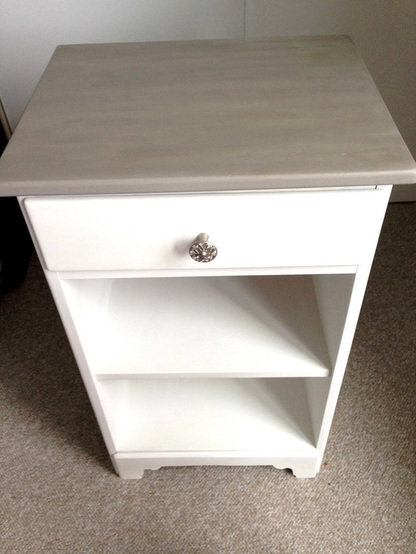 For the rest of the piece, I used Pure White chalk paint from Annie Sloan on the rest of the piece. 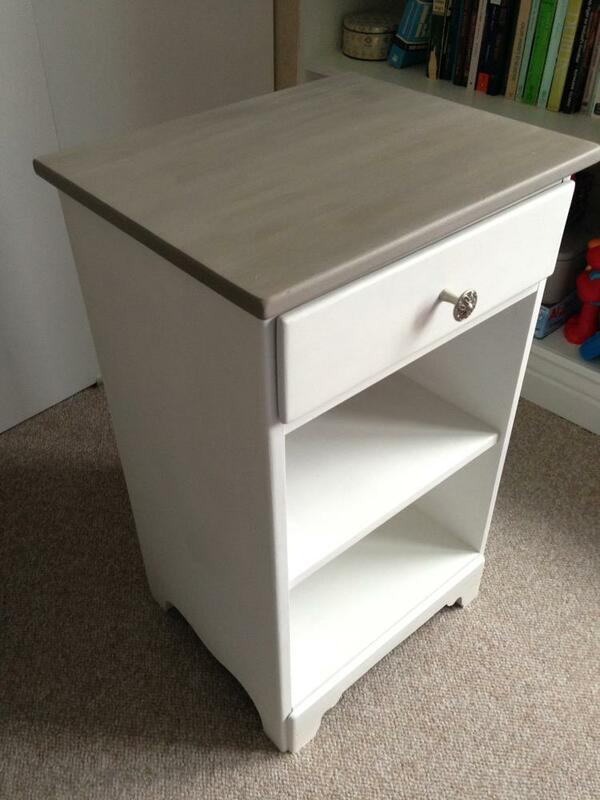 Just as a side note about, the Pure White chalk paint – it is very white. You can go a little overboard on chalk paint materials, so I wanted to keep it as simple as possible. Gloves, mask (if desired), newspaper/brown paper for floor, and baby wipes to wipe down piece prior to painting. Now, it seems like a lot of materials for chalk painting, but there is a lot of leftover paint, and the paintbrushes can be reused on any painting project. The other thing you might be worried about is using wax. I read about a lot of others having trouble with waxing after the chalk paint. 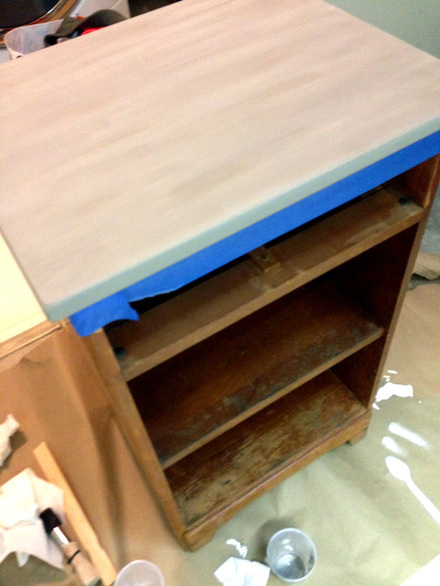 However, do not worry – the wax was the simplest part of the chalk paint process!! Wax is way better to use than polyurethane, and it went by way quicker than the painting. With these simple four steps, you will be able to beautifully chalk paint a piece of old furniture. 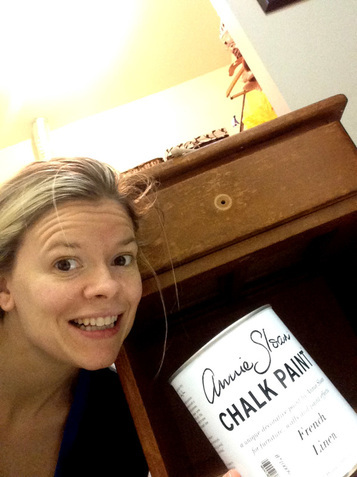 Here I am ready to give this old nightstand a fresh new look with the following chalk paint steps. When getting started with the chalk paint process, first clean your piece really good so the chalk paint will stick. I like using baby wipes to clean off furniture. Then remove any hardware – like drawer knobs – unless you plan to paint these. First, tape the edges of the piece. Then you can you can uninhibitedly chalk paint the top. Then, start brushing on the French Linen chalk paint. 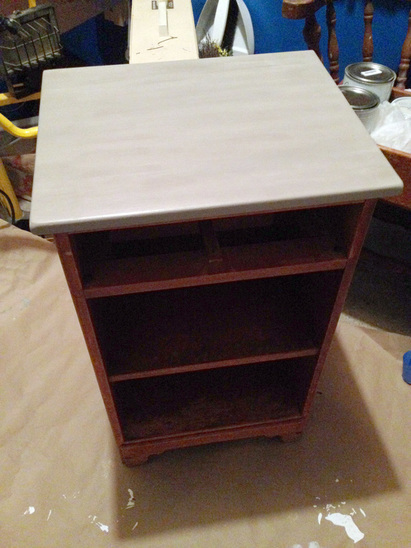 Chalk paint goes on just like any other paint, so I gave it a good, thick coat of paint going with the grain. You can go against or in any direction, if you want your whole piece to have an uneven, distressed look. As for brushes, I used the round brush – but any of the brushes would have been fine. As you are chalk painting, watch for edges and any dripping. The paint is thick, so it doesn’t drip too much; however, because the chalk paint dries fast, you’ll want to catch any potential mistakes quickly. Let the first coat of chalk paint dry. It took about 30-45 minutes for me. Chalk paint dries super fast! If you want the top to have a uniform color, then apply another coat. ​Paint a second coat of French Linen, adding a little water in. This coat is different because you are going to add a little water into the gray. Because chalk paint is thick and fast-drying, it’s hard to brush other colors into it. Adding a small amount of water will make the paint a little easier to work with – keeping the paint wet longer, which allows you to brush in the white chalk paint. As for an amount, you can just lightly dip your brush into a cup of water or you could use a plastic cup to put some chalk paint and water into. Again, just a little dip into the water will go a long way with the chalk paint. 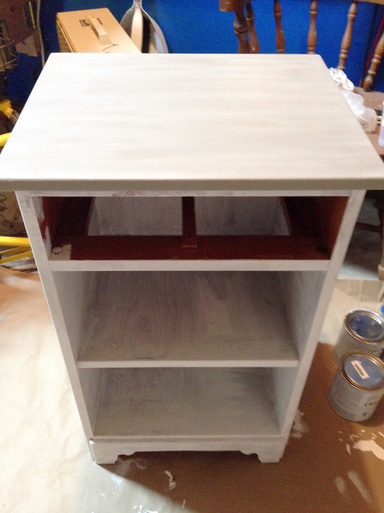 After you give the top a second coat of watered down French Linen, while it’s still wet, it’s time to put some white streaks onto the gray chalk paint. Use the Pure White chalk paint and dab your brush in – just a small dab. You can run the brush along a piece of paper to get rid of any excess. The goal is to create streaky white brush strokes on your gray. The round brush is perfect for this. You can make subtle white streaks like I did – or you can make them more frequent and apparent. If you have too much white, then use the gray again – keep layering it until you are happy with how it looks. Remember it’s not supposed to look uniform. The strokes of white are creating character and dimension. Let the chalk paint dry again – 30 min to 45 should be good. Last, use the dark wax on your chalk paint. Similarly to how you just used the white, you are going to lightly (very lightly) dip your round brush into the dark wax. Only the very ends of your brush should have wax. Just as you brushed on the white paint, brush on the wax here and there, giving the piece more dimension. If you put on too much of the dark wax, then layer again with the gray chalk paint until you are happy with the results. I used a very small amount of the dark wax because I wanted more of an even look. As far as creating this look, I found this part of the chalk paint process so much fun, and I am not even an artist. Rather than just painting brush stroke after brush stroke to cover area, it was something different – and was quite fun and relaxing to create this dimensional look with chalk paint. It was definitely one of my favorite steps of the chalk paint process. Also, as mentioned before, if you make mistakes or aren’t happy with the way it looks, it is easy to fix by touching up the chalk paint. Now it is time to chalk paint the rest of your piece, leaving the top that you just painted as is. I used the Pure White chalk paint and used the angular brushes to put it on. Don’t forget to also do your drawers. 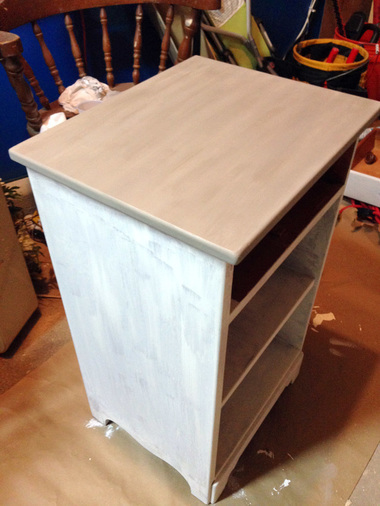 The first coat of chalk paint will look streaky (pictured below), but a good, thick coat helps. After the first coat of chalk paint dries, give the piece a second coat of chalk paint. My piece was still pretty streaky after two coats of paint (pictured below). I did one more coat of chalk paint, which made for a total of 3. For the chalk paint to go on smoother, you can water it down a little. I did this for my third coat because I felt I didn’t need a full thick coat again. When working with chalk paint, or any kind of paint, I suggest working in the brightest light possible. If you can, bring more light into your work space so your space is as bright as possible. This will accentuate any dripping or streaking which will help if your piece will be in a room with lots of light. Waxing is actually a piece of cake. If you are good at cleaning, then you’ll be great at wiping on this wax. Use two rags – you can split your old t-shirt into pieces, and put one rag in each hand. With one rag you are going to wipe the wax on, and with the other, you are going to polish. Start with a small amount of wax (half of the size of a dime) – less is more. Start rubbing it on in circles, like the way you rub lotion into your skin. Work your way across the furniture rubbing in circles. Immediately after, using the second rag, work your way across the piece also rubbing in circles. As you buff, you will start to notice the surface becoming very shiny. This is the look you want! You want to polish in circular motions until it is nice and shiny. Once it’s shiny, move to the next area. Quick Tip: I would use different rags for the top than the rest of the piece in case there is any bleeding from the paint onto the rags. ​Also, you could wax the gray chalk painted top after the top dries in Step 2, instead of waiting until the piece is done. I did this, so I got used to the whole chalk paint process from start to finish, before doing the whole piece. Last, I replaced the knob on the chalk painted nightstand. Home Depot, Lowes, and Hobby Lobby are all good choices for knobs. This knob I had on my telephone table, but I didn’t love it there – but it looks great on this chalk painted nightstand! 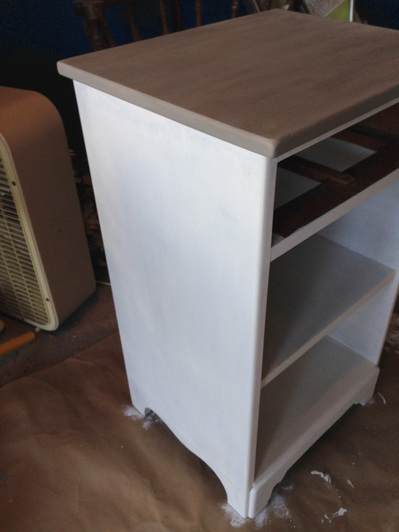 I finished this nightstand within 24 hours I believe – as I kept moving as soon as each coat dried. 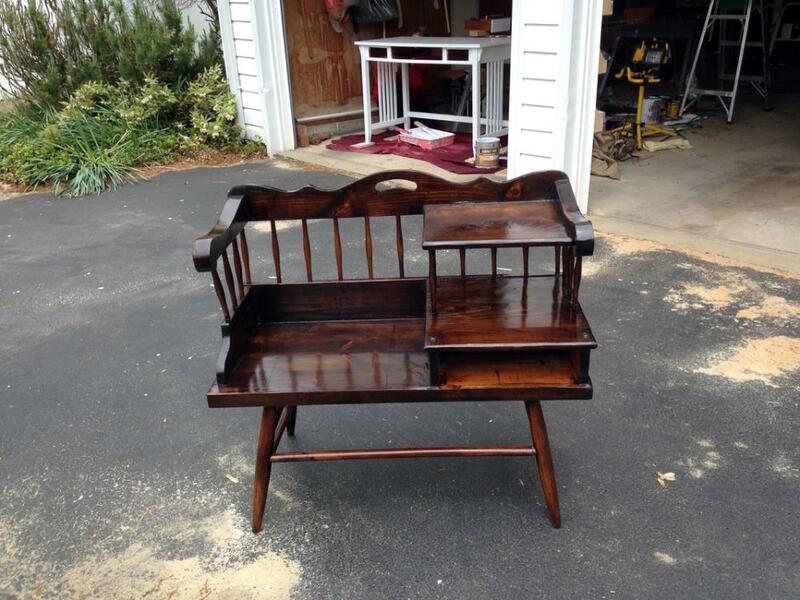 It was definitely my best turnaround time on refinishing furniture. When you take away the sanding, priming, and all that dry time, it really speeds up a project. I loved working with chalk paint, and the results are just amazing. It simply doesn’t look like the same piece. 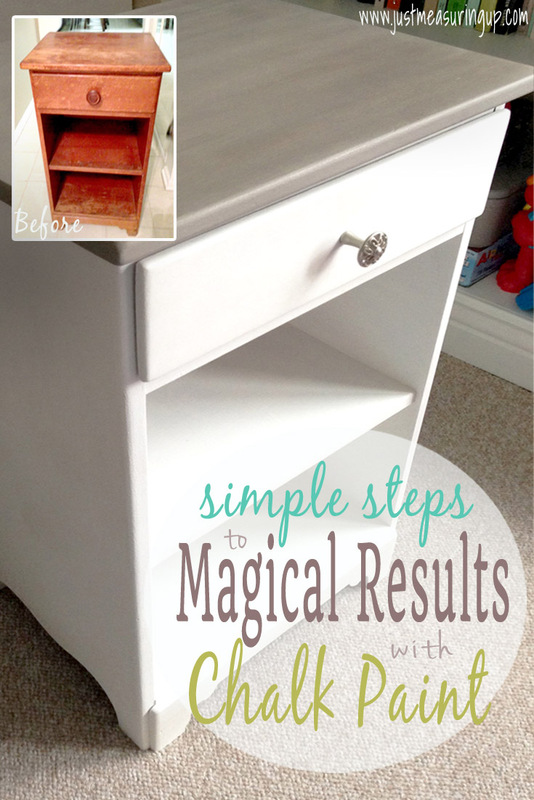 And, the chalk paint process is really easy. Also, I have a ton of leftover paint. I went through about 1/8 of the quart of white and barely touched the gray chalk paint. Our old piano is going to be my next chalk paint project – I can’t wait to see how it will look. Stayed tuned (ha ha pun intended!). 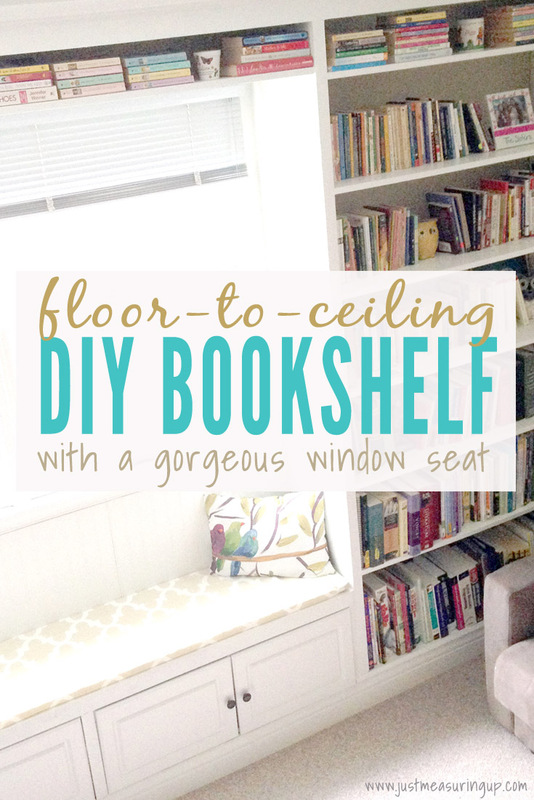 How to Build Floor-To-Ceiling Bookshelves (With a Window Seat) Post Preview: Learn how to make built-in bookshelves with a window seat and cabinets below. The tutorial is simple-to-follow, and the bookshelves turn out beautiful. Ever since building my first bookshelf in our first home, I’ve had a hankering ever since to do another one but on a much more grand scale. My wish came true when Eileen came to me one day with some ideas for her office in our new home. An exciting project was brewing! Since we didn’t have any large bookshelves in our present home, most of the books we packed up during our move were still in boxes. I’m talking cartons and cartons of books. They were taking up a lot of valuable space in various locations around the house. So bookshelves were sorely needed. Initially we were leaning towards a large L-shaped bookshelf in the office. Then Eileen had a great idea of placing the bookshelf against the window wall and incorporating a window seat. The office window wall was very bland and not very exciting to look at. It was almost begging for a renovation. Although it would provide a little less shelf storage than our initial L-shaped shelf idea, it would still be more than enough for all our books. Also, the window seat would provide a little extra underneath cabinet storage, which is a pretty cool feature. The project was essentially going to be two separate built-in bookshelves (on each side of the window) with a seat connecting the two in the middle. The seat would be sitting atop some wide kitchen cabinets for extra storage. 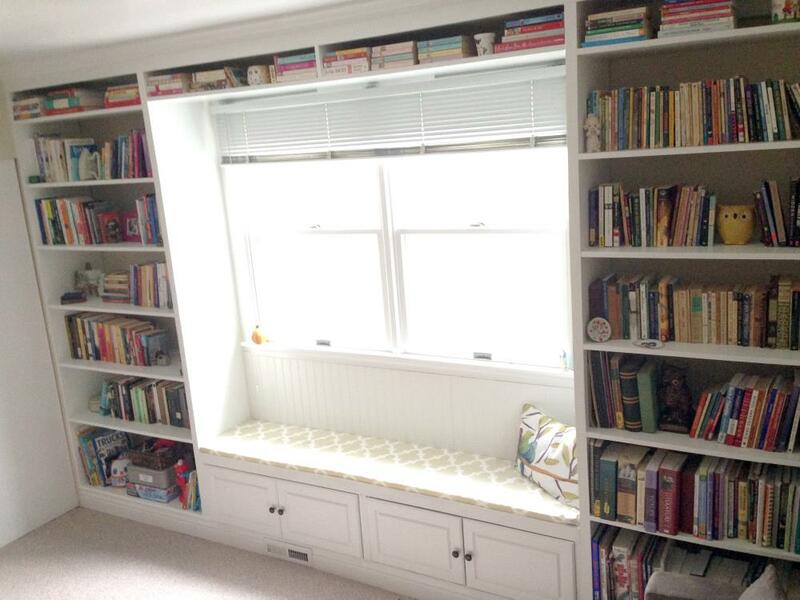 ​Above the window was just enough space for a single small shelf to store decorative items or horizontal books. Finally, some baseboard would run along the bottom, and some crown molding at the top. Some designs I saw online used a standard shelf depth (around 12”) with the seat extending out further. Eileen didn’t want a protruding edge, and she has the eye for design. So to prevent this, the depth of the seat had to be the same as the bookshelves. Due to a closet opening on a perpendicular wall, I was restricted to a maximum depth of 15”. I was a little worried that this would not be enough depth to sit comfortably on, but a few trial sittings on 15” planks of wood proved to be acceptable. This also meant deeper than normal shelves, but I wasn’t too concerned. I’m sure any extra space behind some books could be put to good use. With the design for built-in bookshelves flushed out, I was ready to begin. I strongly considered using melamine covered particle board for the shelves, but instead opted for some good quality birch plywood. Although the birch was a little more expensive, I wasn’t comfortable embarking on a project this size using melamine – a material I have never really worked with before. Also I wanted to use a stronger material than melamine covered particleboard. 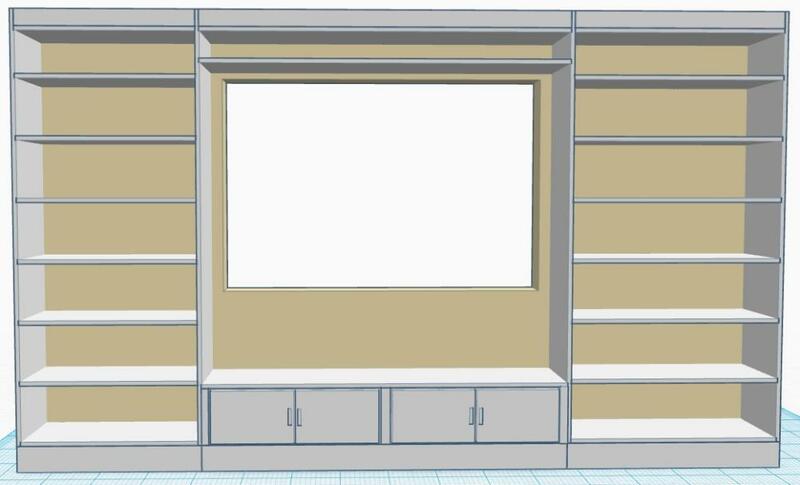 Next, I used a drawing program on my computer (Photoshop) to calculate the minimum number of 4 x 8 sheets of plywood needed to cut out all the required bookshelf pieces. I then placed a Home Depot delivery order for all the bookshelf lumber (including some 2 x 4s and 2 x 6s for various segments in the design, baseboard, and crown molding for the trim and some miscellaneous hardware). When the bookshelf wood arrived, I quickly cut the plywood sheets into 15” wide strips using my circular saw and stored them for use shortly. With all the materials on hand, I started the project. The first step was to remove the carpeting where the bookshelf would rest. 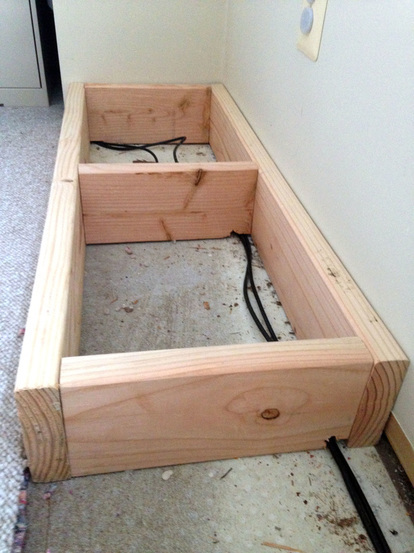 For a flat platform to build on, it needed to sit directly on the floor plywood sheathing. I accomplished this with the help of my utility knife and a metal ruler to help guide the cuts. Then I removed some existing baseboard trim so the bookshelf could sit flush against the wall. The use of my oscillating multi tool helped out here to remove just enough baseboard, leaving the rest intact, so that the bookshelf would seamlessly blend in. Once all the bare plywood flooring was exposed and baseboard removed, I started work on the foundation for the two end bookshelf segments. They would rest directly on the bare floor. I assembled the frames from 2 x 6 wood. While constructing the frames in the garage, the corners needed to be very square. I didn’t have a 90 degree clamp at the time to assist, so using a scrap piece of 2 x 4 and two handy bar clamps, I got creative. I left the middle foundation frame (that the seat would rest on) for last as it would be a little trickier than the others. I settled on a very simple yet effective method. I was just going to build a wooden duct into the foundation frame, and seal the inside edges with caulk to make it air tight. Once the foundation frames were complete, I secured them in place. I used some lag bolts to attach the rear of the frames to some wall studs. Then I used some L brackets to secure the front to the plywood flooring. You might have noticed a number of pocket holes in my construction. They are very convenient for attaching wood perpendicular to another one, especially in tight or not easily accessible areas. With the help of a jig (I use the Kreg Pocket Hole Jig), they are very easy to make. Helpful Tip: Here’s a useful trick I used while making the foundation frames. I had made a few alignment errors on the first frame, and so had to unscrew a few pieces and adjust. Some wooden toothpicks came in very handy to plug the existing screw holes so that I could re-screw very near to those holes. With the foundation frames in place, I decided to start work on the shelves. 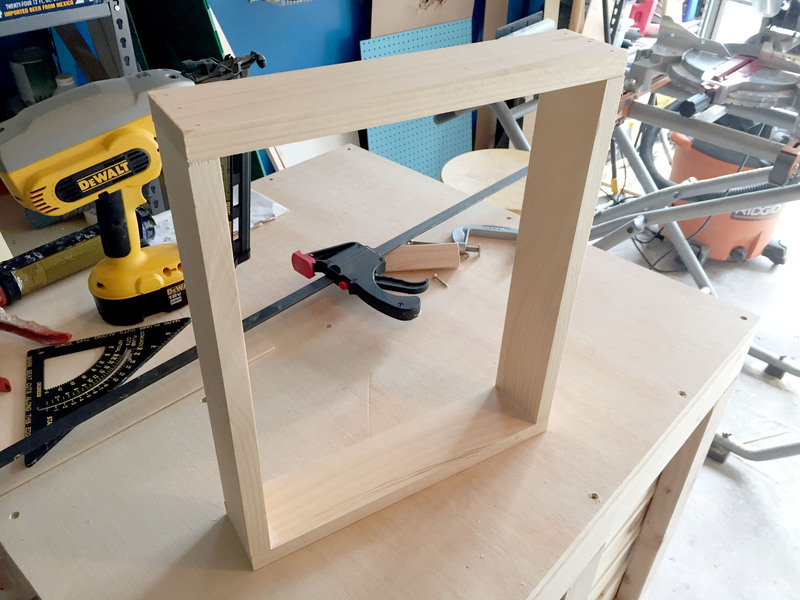 I was going to use the same technique as my first bookshelf I built in our old home – dado grooves to support the shelves, cut with a standard plunge router. 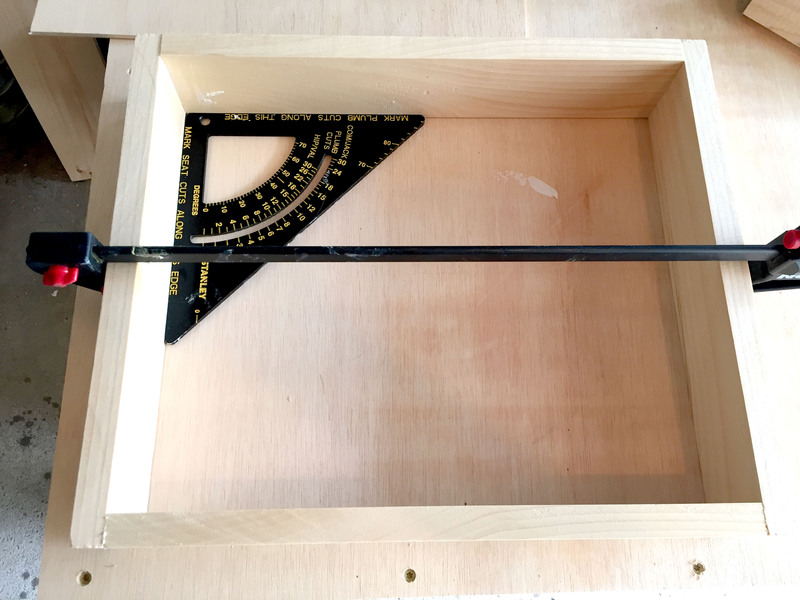 To start, I placed 2 of the bookshelf vertical end supports side by side, clamped them together tightly, and marked with a pencil where all the dados were to be cut. Then using some scrap wood, I built a simple jig for my router to speed up the cutting and make all the dados identical. 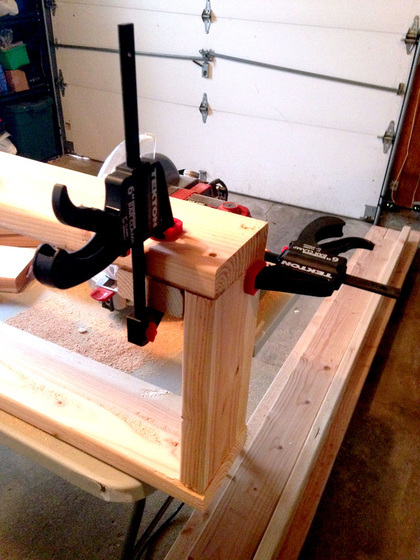 Here are some pictures showing the the jig and the router in action. 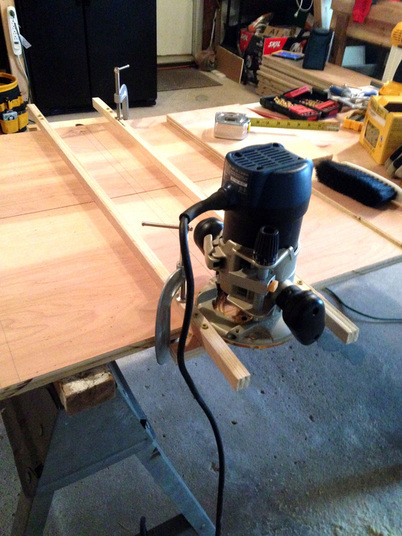 With the help of the jig, cutting the dados was pretty effortless. Eileen even lent me a hand and cut some of them for me, while I did some other tasks. 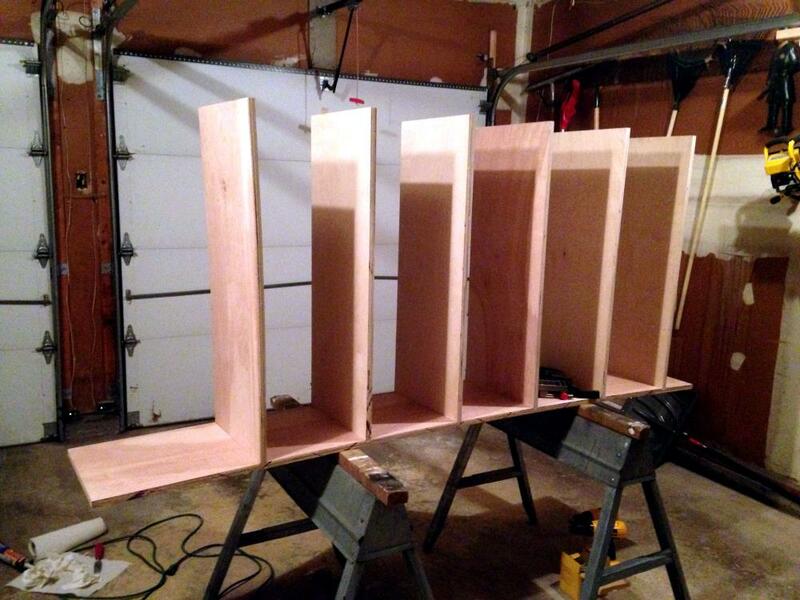 After the dados were all cut, I started attaching the individual shelves. To do this, I first applied some construction adhesive to the side of a shelf. Then I inserted it into one of the dado grooves. Then while using some right angled clamps to hold the shelf in place (I decided to buy some to assist with this project), I fastened 3 deck screws from the other side to complete the task. Only the inner shelves used dado grooves. The top and bottom shelves were attached with just adhesive and screws. Next, I applied more adhesive to the attached shelves, and dropped on the remaining dadoed vertical support. Each shelf had to be adjusted so they fit perfectly into the dado grooves. Screws were also inserted to secure the connections. 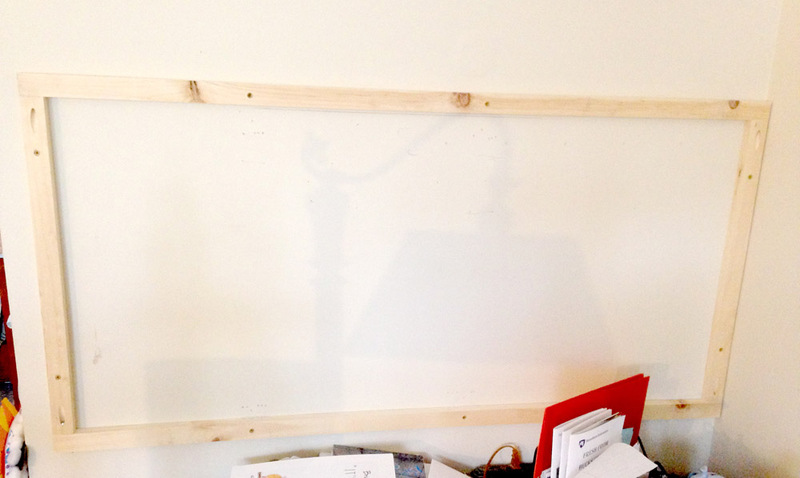 ​Finally, I ran a 2×4 wood by the top shelf to serve as a mounting point for securing the bookshelf to the wall. 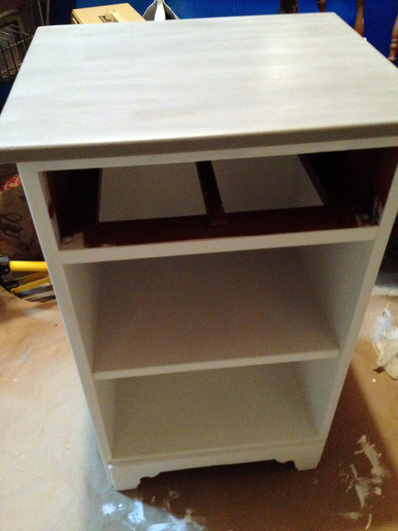 To complete this bookshelf, I put on 2 coats of primer, and then 2 coats of a special urethane acrylic cabinet paint. I was worried about regular paint sticking to the books after sitting for some time, so I opted for this hard protective cabinet paint. 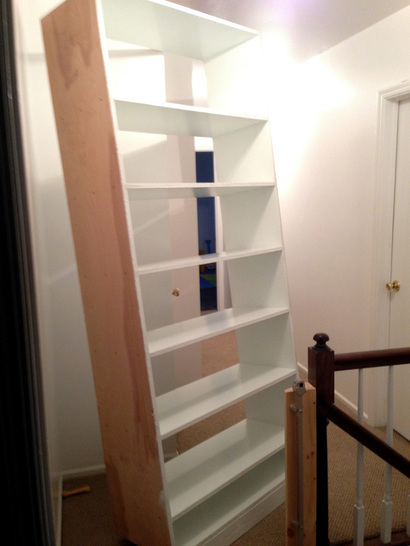 Then, with the help of Eileen, we carried the bookshelf upstairs and set it in place. Getting the shelf upstairs was no easy task, by the way. I knew ahead of time that it was going to be a tight fit, but not impossible. 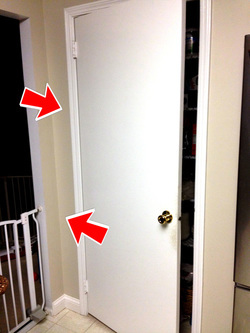 Here’s a picture of the shelf leaning, while we figured out just how to get it through the doorway. The other bookshelf on the opposite side is actually slightly longer than this first one (due to the window not being perfectly centered on the wall). So we knew ahead of time that the second bookshelf would definitely not fit in our stairway and would have to be constructed upstairs in the bedroom. Using some deck screws, I attached the bottom shelf directly to the foundation frame. The left side of the shelf (touching the wall) was secured directly to some wall studs. Finally, I secured the 2×4 cross piece at the top to some wall studs using some lag bolts. 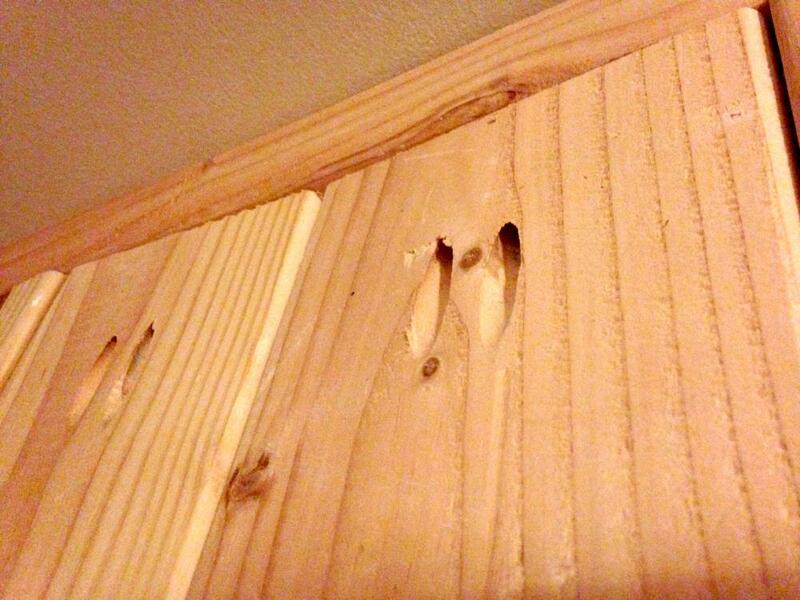 Aside from the 2×4, I had used a countersinking drill bit to make the screw holes in the shelf. This made a clean hole for the screw to be countersunk without damaging the expensive birch plywood. I planned on filling in these holes with wood putty later to hide the screw head completely. Now it was time to start work on the second bookshelf that would sit on the right hand side. As mentioned earlier, it was a few inches longer than the first one and would have to be constructed in the bedroom, rather than in the garage. I did as much as I could in the garage though. First, I cut all the wood to the required sizes, and routed the dados using my jig. I also painted the individual pieces in the garage as well. Also, I had to be careful not to get too close to the edges of the shelves with the paint though. 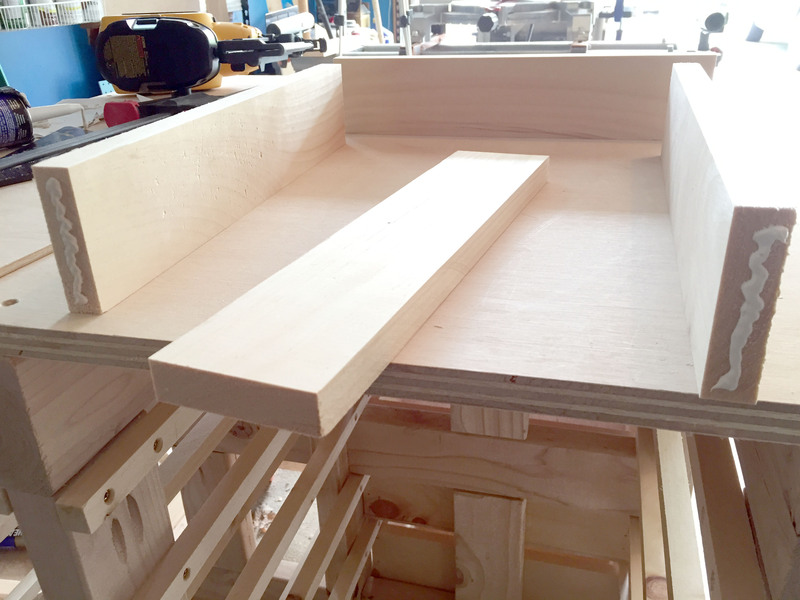 The edges would slide in the dado grooves, and any paint (particularly the urethane acrylic paint) would increase the thickness of the shelves and make this step difficult. Working between the garage and the upstairs bedroom meant frequent trips up and down the stairs. Many times I would have a handful of tools to juggle. Then during one of my frequent google search sessions for tool organizing ideas, I came across bucket organizers for tools. I didn’t even know they existed. 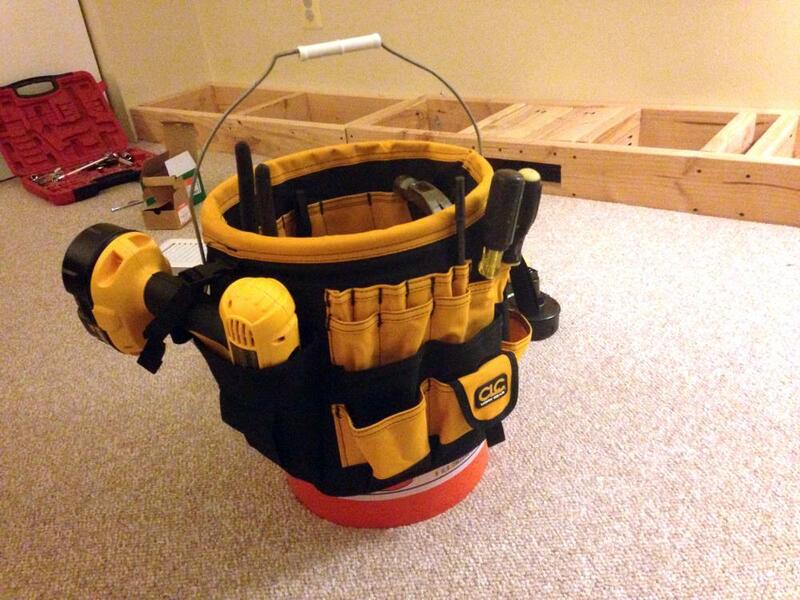 What a great way to repurpose the standard bucket. So I purchased one and made my garage/bedroom commute a lot easier. 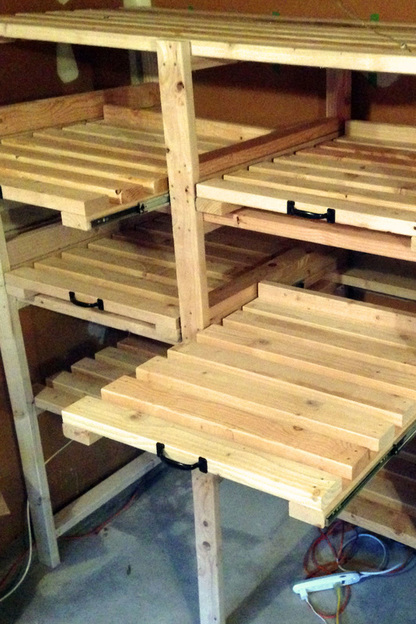 Next, I transported all the individual shelf pieces upstairs, and started assembly with the help of some saw horses. It was a little more difficult to work in the bedroom due to the limited space, but it was manageable. After the pieces were put together to assemble the bookshelf, I set it in place using the same steps I went through for the first bookshelf (securing to the wall and to the foundation frame). Both the left and right bookshelves were up at the point, and they were looking great. 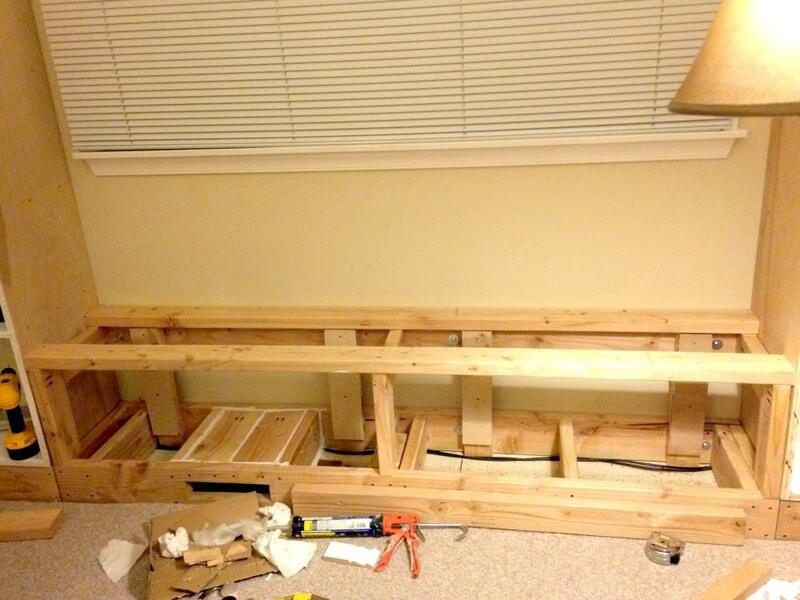 So next I started working on the middle portion – the seat and cabinets. The cabinets were pre-fabricated ones I purchased online from Lowes. I got two of them to mount side-by-side. I just had to assemble them when they arrived. To get the cabinets ready for installation, I built a framed housing for each. The I slid the cabinets into the housing, and screwed them in. The top of the housing would also serve as the supports for the seat. With the seat and cabinets in place, it was time to install the final shelf above the window and get ready for the trim work. To start, I ran three 2 x 4’s across the top of the bookshelves (in between the top front of the bookshelves and the ceiling). Their primary purpose was to provide a nailing surface for the crown molding. In addition, the middle 2 x 4 (that bridged the two bookshelves at the top) was going to help support the middle shelf that ran above the window. I didn’t use dado grooves for this window shelf. I just used construction adhesive and screws to attach two plywood shelf pieces in between the two end bookshelves. The top shelf piece also attached to the bridging 2 x 4 above. This window shelf was really long though (the same length as the seat), so to prevent it from drooping in the middle, I added a divider in the center to hold up the bottom shelf to the firmer top shelf. Now it was time to install the crown molding and baseboard. This was a relatively straight forward step. I had installed crown molding in the kitchen of our previous home, so was familiar with the procedure. This time around though, I had a table saw, so the install went even easier. 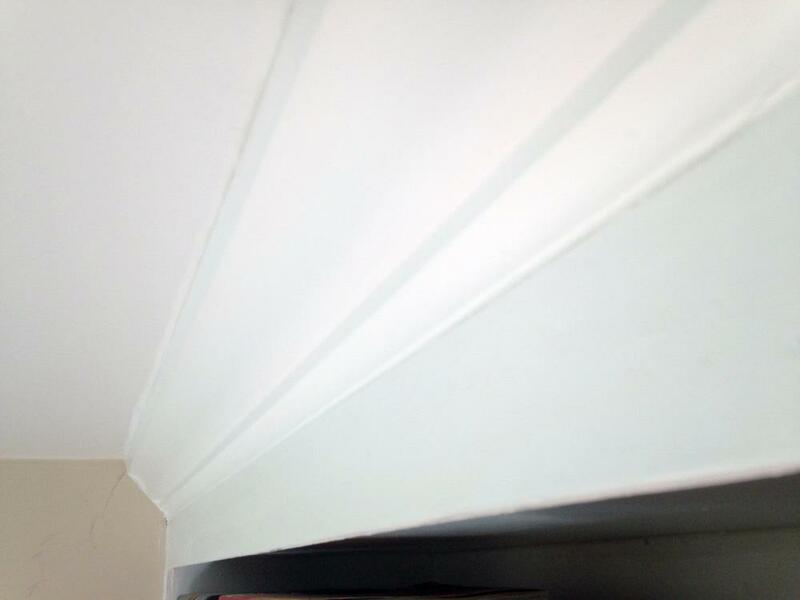 For an easy crown molding install, having an angled surface to nail the trim into place is key. So I measured the angle of the crown molding (the angle it would make with the wall), and ripped some 2 x 4s with my table saw to match this angle. I attached them directly to the 2 x 4s already mounted on top of the bookshelves. Then, I used my finishing nail gun to attach the crown molding. 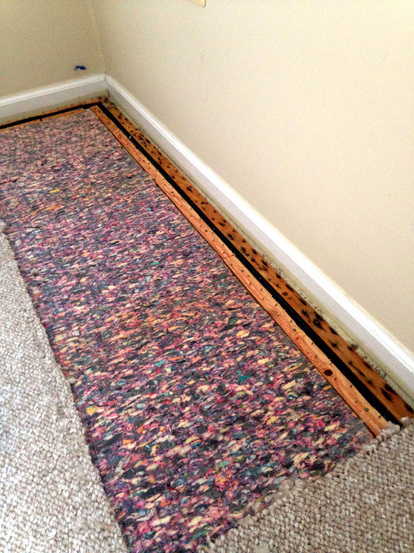 The baseboard installed even easier. I just cut the pieces to length and secured them in with the nailgun. 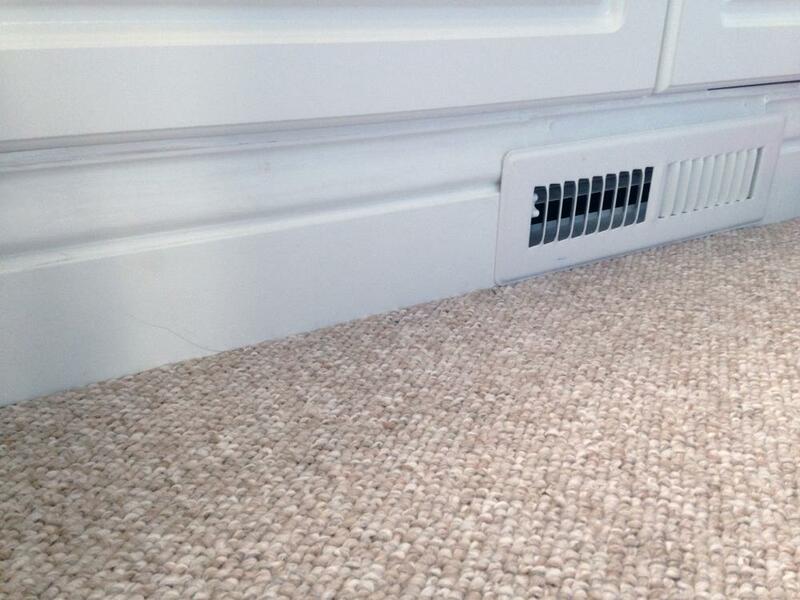 The vent opening on the floor just needed a small top and bottom piece of the baseboard to blend in. With the crown molding and baseboard installed, it was time to attach trim to cover the exposed edges of the plywood. I couldn’t leave the bookshelves as they were because the plywood edges were very rough to the touch (easily leaving splinters) and were not very nice looking. 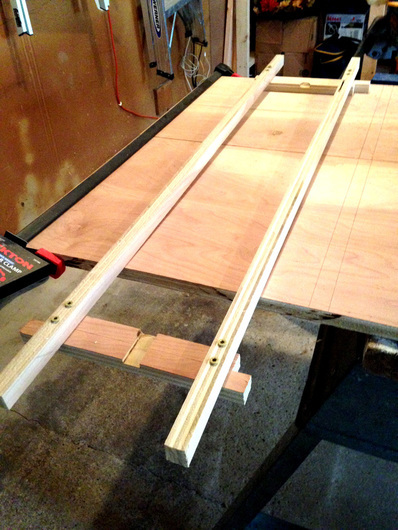 To save on costs, I decided to cut my own ¼” thick trim from 2 x 4s using my table saw. I collected all the measurements I needed to cover all the exposed areas and got to work in the garage cutting the trim. It worked out fairly well – although there were a number of knots in the wood causing several of the trim to break because they were so thin. Also, other imperfections in the wood caused a few gouges in the cut trim. So it definitely wasn’t perfect trim, but considering how cheap it was to make from 2 x 4s, it was worth it. Besides, after the trim gets installed, I planned on patching up any flaws with wood putty. Then, once painted, the trim would look flawless. Construction of the window bookshelf was pretty much complete at this point. 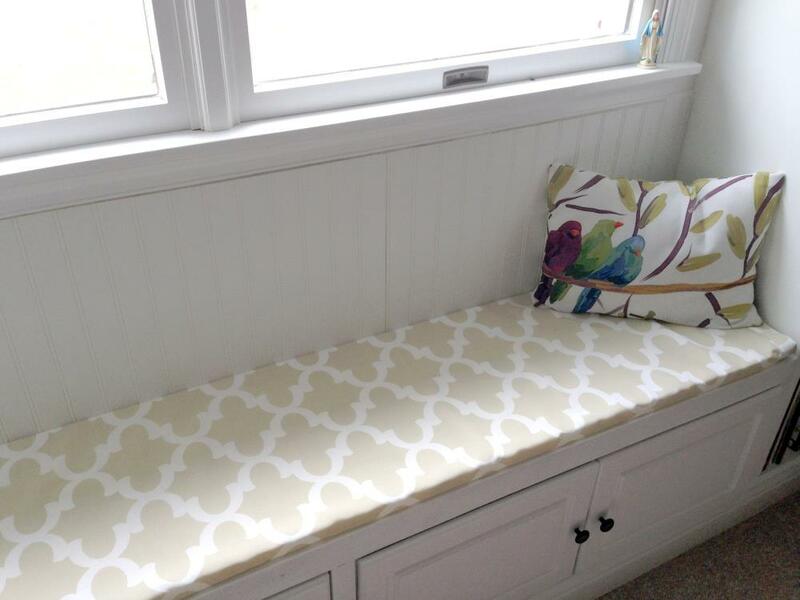 I did attach some beadboard paneling above the seat with construction adhesive and the finishing nailer. All that remained now was to fill all the countersunk holes with wood putty, patch and smooth any imperfections in the trim, caulk any small gaps (mostly with the crown molding and baseboard) and then apply paint where necessary. Eileen hopped in at this point to take over the painting. She painted all remaining wood – going over the edges, getting the trim, and touching up areas here and here. She also painted the areas to the right and left of the window (which were currently still the color of the walls). That really made the bookshelf pop. The project was now finished. Eileen immediately filled up the shelves with all the books we had, freeing up much needed space around the house. She even made a really nice cushion for the seat from scratch. 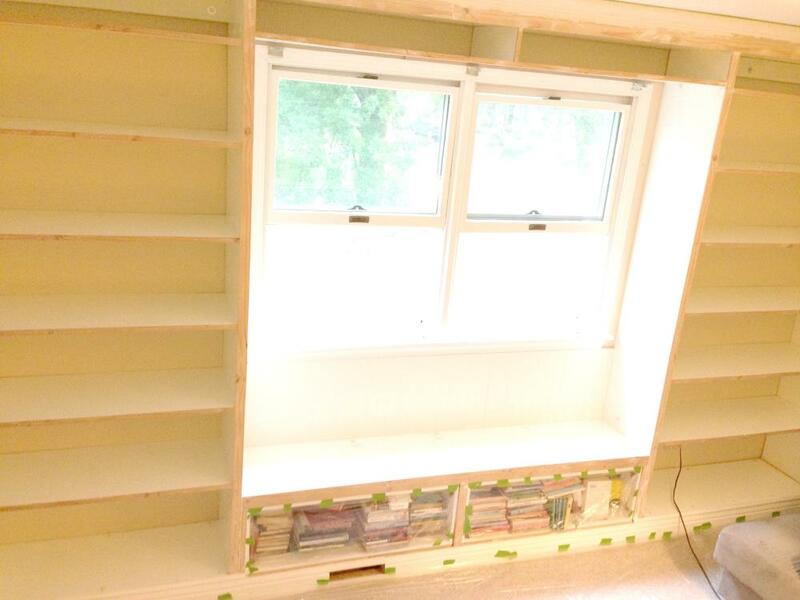 Here are a few more of the completed built-in bookshelves with a window seat. 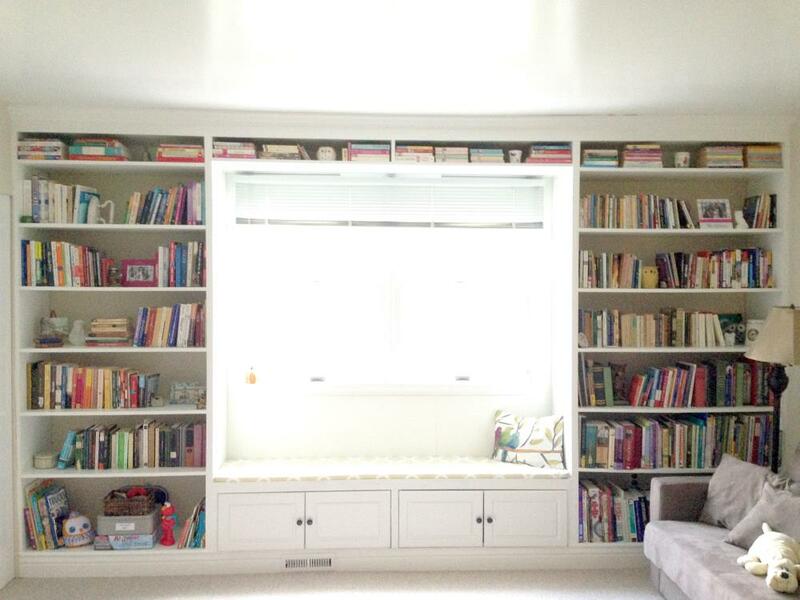 The total cost of the built-in bookshelves project was around $600 and took me a few weeks to complete. It was a lot of fun to work on, and the payoff was huge. It’s such a great addition to our home, and Eileen has a place that she loves for all of her books – it’s definitely her dream room now. 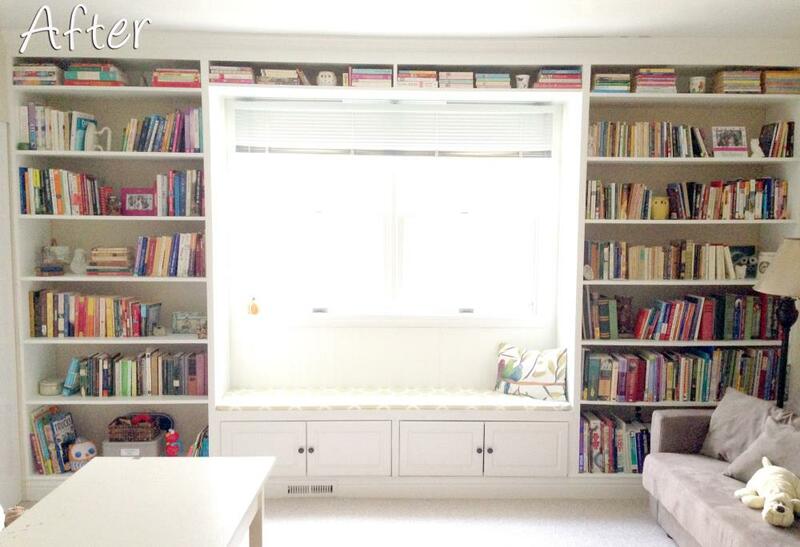 Who wouldn’t want an entire wall of with floor-to-ceiling built-in bookshelves?! To complete Eileen’s office, which is a sitting room off our bedroom, it needs some kind of doors. We are thinking about French doors or barn doors. What do you think?! 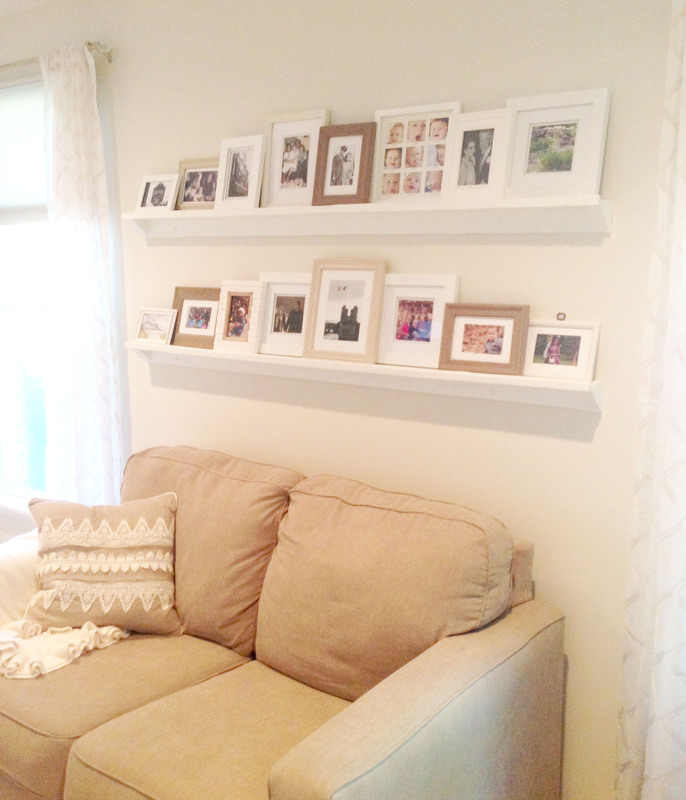 Do you have a bunch of picture frames lying around and a couple hours of time on your hands? 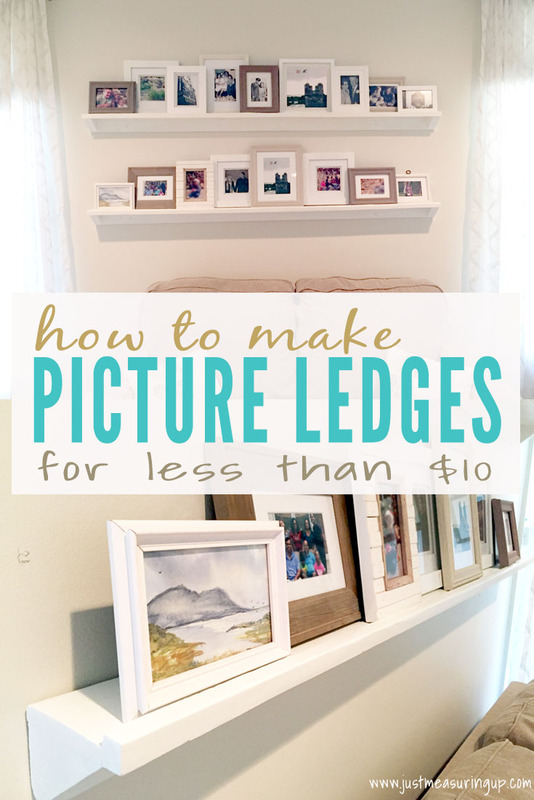 Make a DIY picture frame ledge. It’s simple to make, easy to arrange, and looks quite elegant. Since our move, we still have boxes of pictures frames taking up way too much of our closet space. However, we are one ample box lighter, due to the awesome picture ledge that Ash made. As I was digging through the box that held the white, cream, and grayish frames, I thought about a gallery. However, I already had one on a neighboring wall, so I wanted something different for this collection of pictures. That being said, one of Ash’s least favorite chores is hanging pictures up on our walls. You should hear how he tries to procrastinate the task, let alone see his expression when he languidly follows me around the house with a hammer and nails. 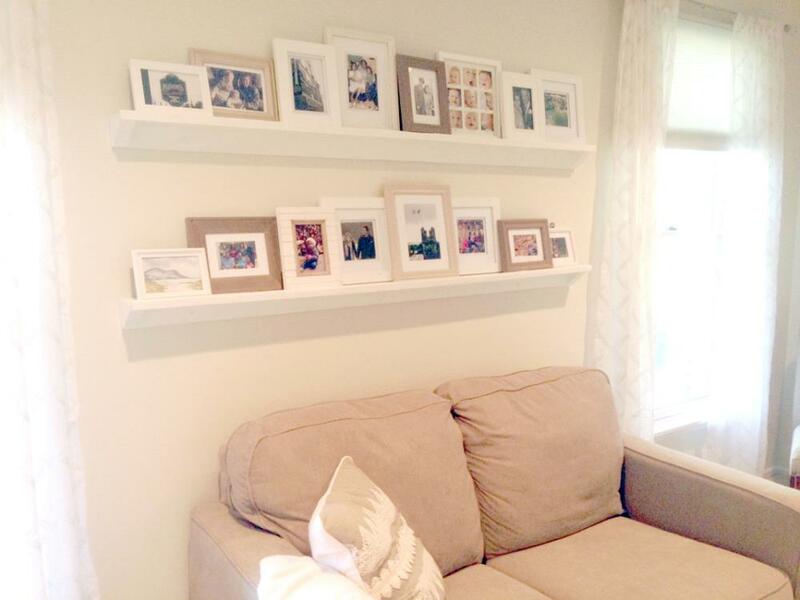 Would you know he had both photo ledges built in a couple hours? He used all scrap wood, and then I painted with furniture paint for a nice finish. You can make them too for under $10! 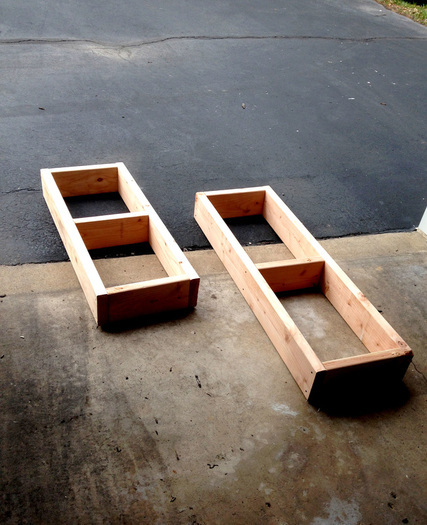 ​Here are Ash’s instructions on how he built these simple photo ledges. I was able to use all scrap wood left over from previous projects. I cut the long pieces to the appropriate length. Eileen used the length of the love seat as a basis for how long she wanted the shelves. 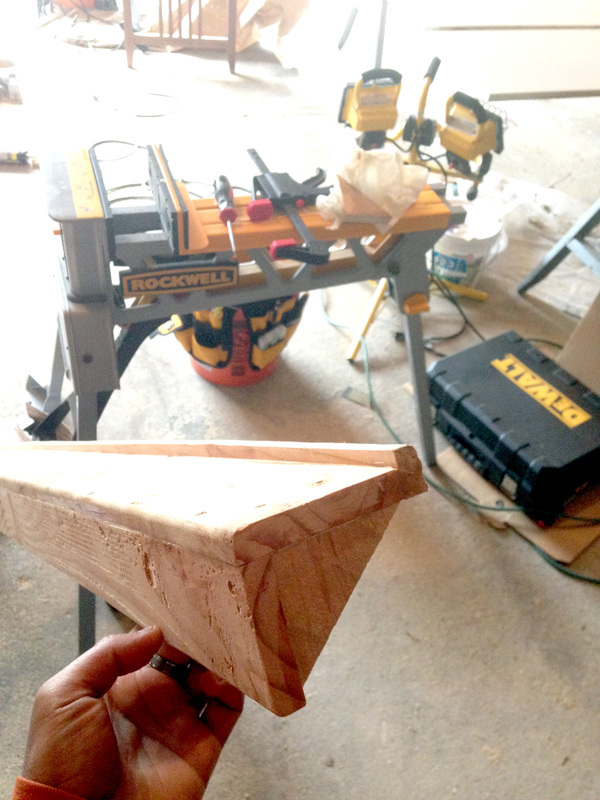 Then, I formed the triangle support ends with my miter saw (this is one of my favorite tools – check out my other favorites). After that, using some wood glue, clamps, and finishing nails, I attached the pieces to each other. Once the wood glue dried, I used the orbital sander to smooth down all the surfaces to make the different wood segments blend into each other seamlessly. Since it was scrap wood, there were a few gouges here and there that I patched with wood filler and sanded down to a smooth surface. Finally, my painter, aka Eileen, gave the shelves two coats of paint, and then it was ready to be mounted to the wall. In mounting, I secured the shelves to the wall using two lag bolts, directly into two wall studs. The heads of the bolts stood out slightly, so to help blend them in, I covered them with some white paint to match the shelves. Looking back, if I had some Forstner bits at the time, I would have countersunk the lag bolt heads to make them flush with the wood surface. The cost of the project was free, as we had all of the material in our garage; however, I estimate the project costing $10 for the wood plus a quart of paint. I loved the way the picture shelves turned out. 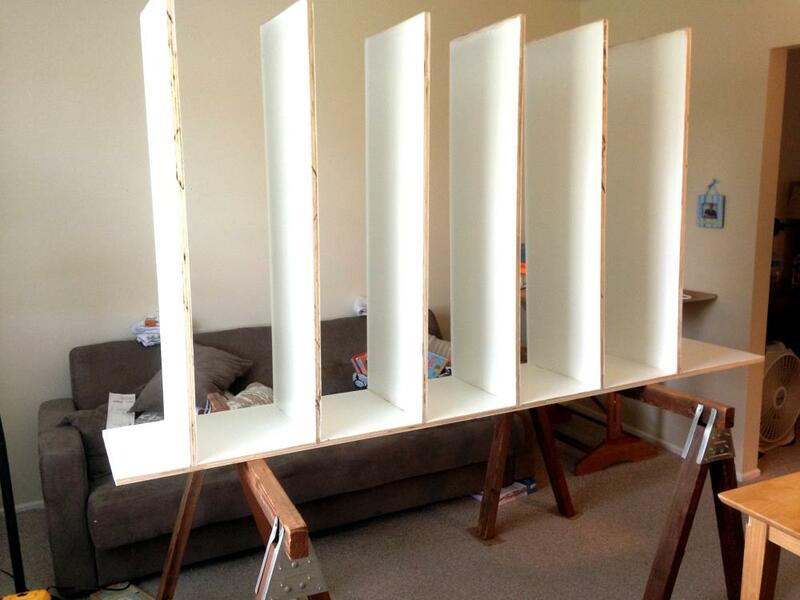 Ash built them so quickly, and without any trips to the store for additional materials, which is always a plus! Everyone who visits has been commenting on how much they like them. A few people have said, “Have these always been here?” That is one of my favorite comments because it goes to show how great they look where they are. Not to mention, Ash was so pleased that we didn’t have to hang all those frames. I haven’t told him we still have two more boxes of pictures in the closet. I’m not quite sure where they are going either. Maybe another picture ledge will be forthcoming. Here’s another angle of our new DIY picture frame ledge. 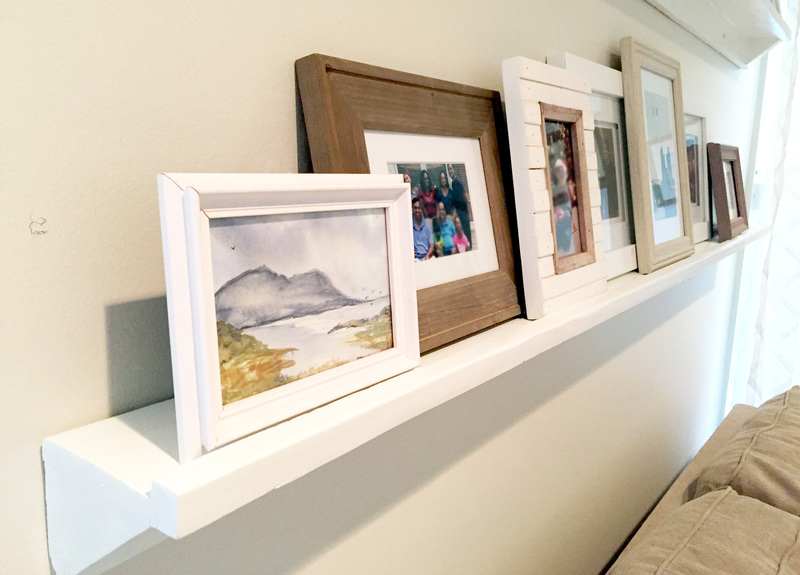 The more I look at it, the more I love it – and it was a lot easier than creating a gallery, and unlike the gallery, I can easily rearrange the picture frames too. Shelving projects are one of my favorites – I just love different ways you can display pictures, books, and other items. I’m sure we will have more shelving projects coming soon. When we moved into our new home, we found an old, tall tower style CD holder shelf that the previous owners had left. It was supposed to be screwed into the wall, but the screws were loose. Seeing it as a hazard, Eileen wanted to remove it and toss it, but I had a feeling that we could repurpose it one day into something more useful. So off it went into the corner of the garage where it sat for almost a year. As the months went by, I was starting to regret my decision of keeping the tower because it was always getting in my way when working in the garage. Then, one day as I was looking for some cashews in the pantry, I noticed something very interesting. One side of the pantry had an extra thick wall. It was actually twice the thickness of a regular wall. How unusual, I thought. My mind immediate jumped to storage. If there was empty space in that wall, it could open up the doors for all sorts of pantry storage ideas. Ever since I built a sliding spice shelf in our previous home (in between the fridge and the wall), I had been eager to come up with something similar for our new home. The pantry was getting difficult to navigate with all our spices, and we could never find anything we needed. Unfortunately, there was no decent space to build the equivalent, so I needed other options for spice storage. 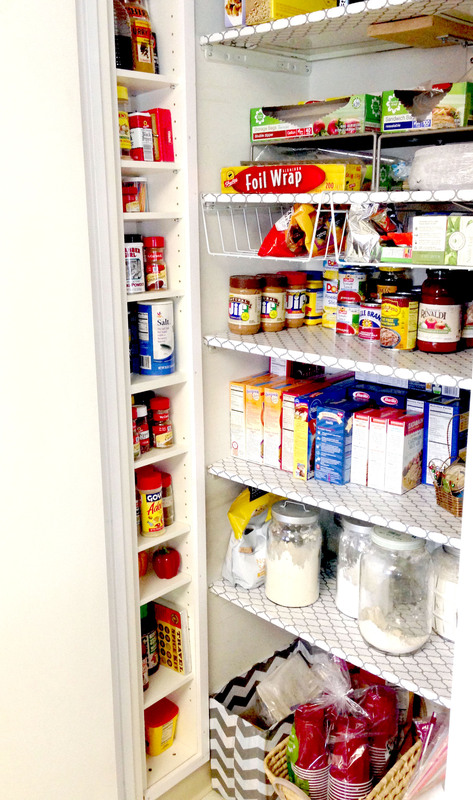 This thick wall was the perfect solution to our pantry storage shortage. First, I needed to assess the wall situation better. I needed to know how much space was available inside this wall. For all I knew, it could have been thick to accommodate a central air duct. I did some knocking on the wall and it sounded very hollow. Still, I needed to know what was inside before unnecessarily ripping off a large chunk of drywall just to find the area impractical for use. I took to the Internet and purchased a very cheap endoscope camera for my computer. The endoscope would provide eyes into the wall and allow me peer around without causing too much damage. When it arrived, I hooked it up to my laptop, tested it out a bit to get a feel for it. 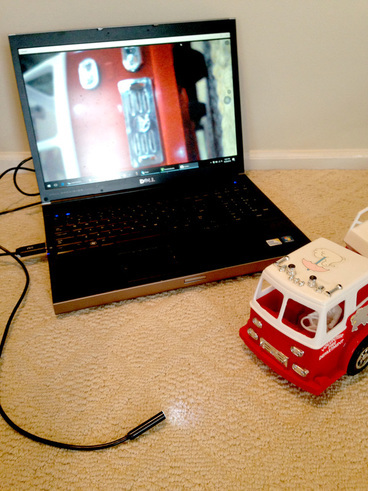 To give you an example of the detail it gives, I placed the camera inside my son’s fire engine, and displayed on the computer screen is a very detailed profile of the driver. After testing it out, I then stuck it into a very small hole I drilled into the wall. The camera had an adjustable light, so I could see inside the dark wall. I looked up and down, and all around, and the endoscope revealed what I suspected all along – a lot of empty space! ​Now that I knew what type of space I was dealing with, I had to brainstorm the best way to make use of it. It was a tall vertical space, so I was thinking along the lines of a vertical shelf to hold spices. That would certainly help with storage. 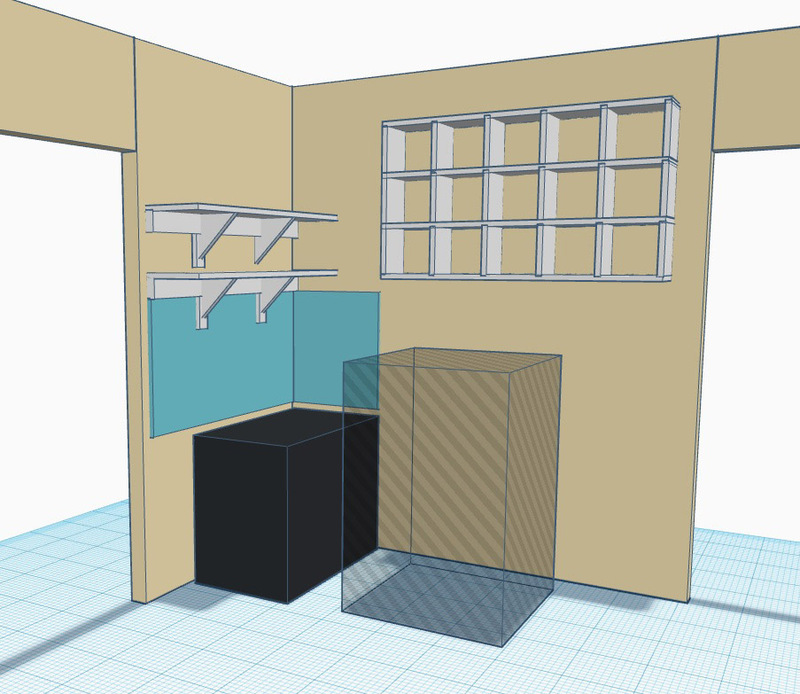 I went off into the garage to plan out designs for a custom-built shelf to fit the area. In the garage, I saw some scrap wood resting in the corner that could be turned into shelf pieces, but once again, that tall tower style CD shelf was in the way. The CD shelf was really starting to test my patience. I was about to finally toss it out when I had a eureka moment. You know, that CD shelf looked very similar in size to the space that I discovered lurking in the pantry walls. I anxiously took out my tape measure and did an exact comparison. The shelf would indeed fit into the wall! Good thing we did not throw out the CD shelf (more reason for Eileen to start accepting my hoard-ish ways). It seemed like the perfect solution for spice storage. It was not very deep, so it wouldn’t hold large cans or boxes, but would easily hold spices and baking materials, which was exactly what we needed. 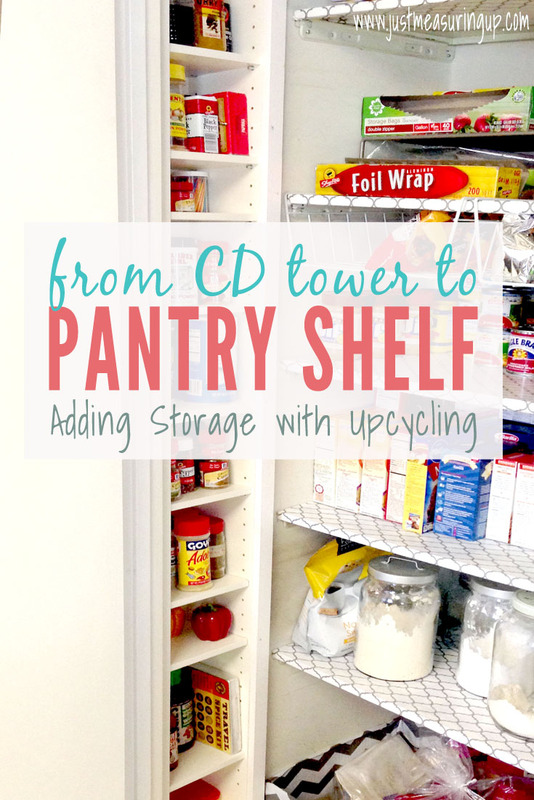 Excited about repurposing the CD tower into a pantry shelf, I couldn’t wait to get started. I love being able to repurpose some of the junk I keep around. It’s my justification for keeping everything. And, we really needed the pantry storage. I was tired of rooting through baskets of spices. I could have used the shelf unaltered, but I decided to make it a little shorter for the pantry. The full height would have sent it nearly to the ceiling, which would made it a little impractical for pantry storage that high. After the shelf was shortened, I needed to cut the hole in the drywall. I first used a pencil and ruler to outline the exact cutout on the wall. Then I used a special drywall handsaw (commonly called a jab saw) to cut out the hole. It was a little messy working with the drywall, so I kept my shop vac close by. After the hole was made, I inserted the shelf into the wall to get a feel for how it would look. It looked amazing! I couldn’t wait for Eileen to see. Now I needed to permanently affix the shelf. The shelf was not resting directly on the floor inside the wall (it was a few inches above the baseboard), so first I had to attach a 2 x 4 cross piece to rest the shelf on. 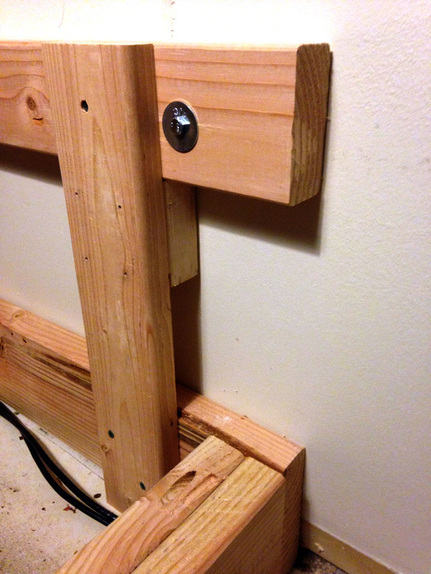 I used my Kreg pockethole jig and some pockethole screws to attach both ends of a short 2 x 4 to the wall studs. I repeated the process to attach another cross piece above the shelf to secure the top. Then I slid the shelf in between the upper and lower 2 x 4 supports and attached the shelf permanently using some screws. All that was left now was to apply some trim. I actually had a lot of extra trim left over from redoing some kitchen baseboard a few months prior. The trim I had originally purchased was too tall for the kitchen, so I had cut it shorter using my table saw. Good thing I held onto the cutoffs. They were the perfect size to use as trim for the new pantry shelf. It was already painted too. I secured the trim directly to the shelf using some finishing nails. I adjusted the heights of the individual shelves to accommodate a variety of spice configurations, and then the pantry shelf project was complete. I loaded it up with all my spices and our baking materials, which freed up so much space in the pantry. It truly was such a perfect pantry storage solution. I’m hoping to repurpose more of my stashed finds in the near future. With the cooler weather coming in, it’s the perfect time for weekend DIY projects. There’s something about the crisp, clean air that motivates me to accomplish more. If you are anything like us, you are probably looking to get a few fall projects under your belt too. 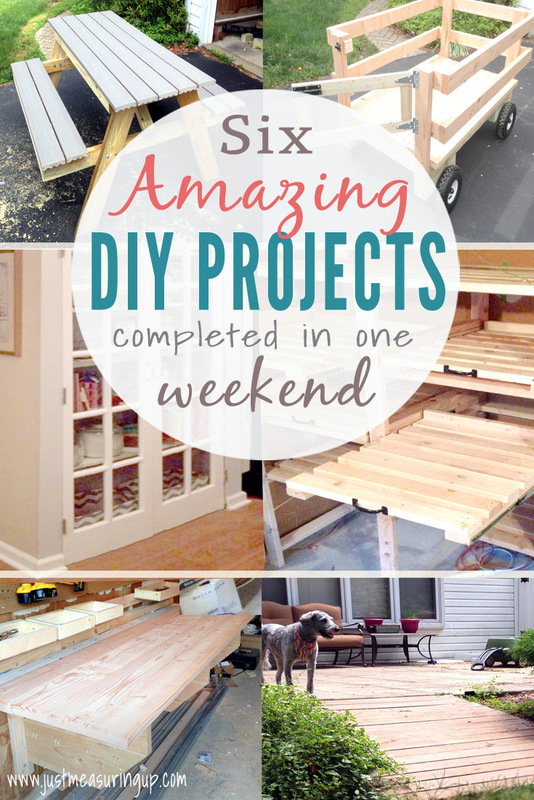 The best projects are weekend ones, as I also love a project that only spans two days! Plus, you can start and finish something amazing before the Monday morning blues set in. From garage storage to backyard updates to kitchen upgrades, we are sharing quite a few home projects that only span a couple of days. My personal favorite is the outdoor picnic table – it turned out so beautiful and we saved hundreds! So, without further ado, here are six projects that you can complete over the course of the weekend. Ash built this picnic table in just one day! It was simple to make, and the results were beautiful. We especially love the composite decking on the tabletop and the seats, as it involved no staining or sealing – and provides a nice safe material to have meals on. As for cost, this was a steal ($160!) compared to the cost of this type of outdoor furniture at the landscaping and home improvement stores, and it looks just as wonderful. It was definitely one of our favorite weekend DIY projects. 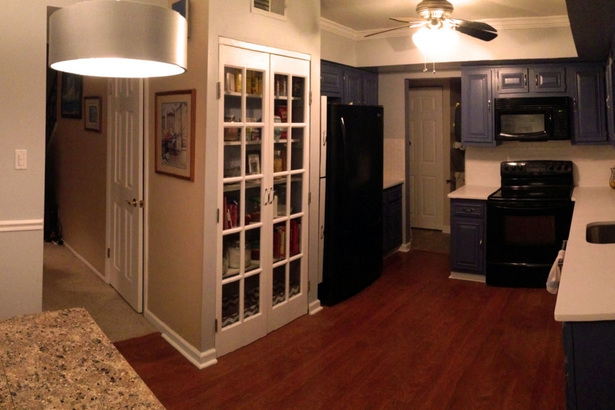 In our old house, we had an eyesore of a pantry. It was nothing more than a nook of shelves with drawn curtains. It was nothing short of awful. In sprucing up our house for our move, I was looking for ways to make our kitchen look less dated, without updating the counters and cabinets. ​We found a reasonable pair, installed them, and painted them white. 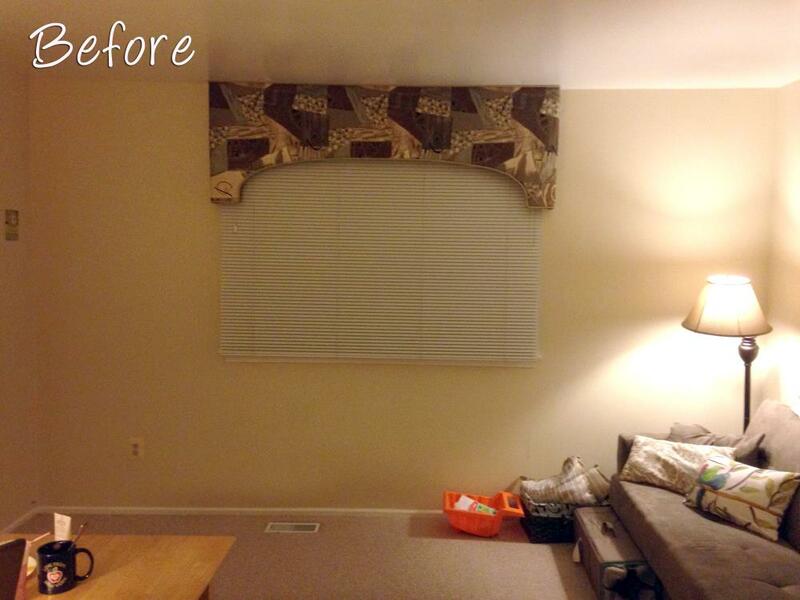 I couldn’t have been happier to see those awful curtains go – it was definitely a rags to riches moment! It took a mere weekend of work, and I’m sure the nice folks who bought our house are enjoying them. Check out the before and after along, with all the nitty gritty details in From Rags to Riches: Updating the Pantry. 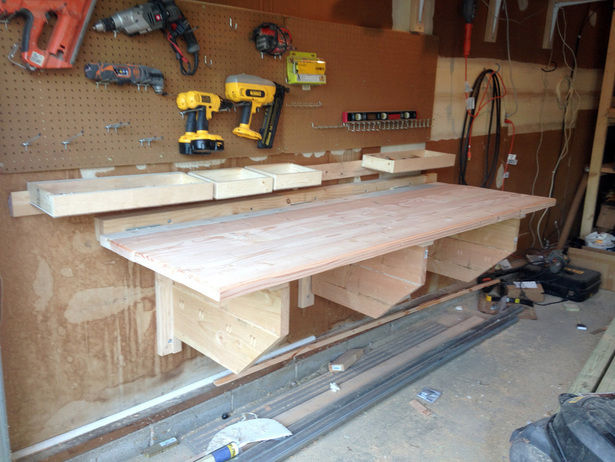 This project was one of Ash’s favorite weekend DIY projects because he checked an item off his bucket list, as he finally built his own functional workbench. It’s definitely a fan favorite, as it’s been featured on quite a few sites, including Life Hacker and Make. 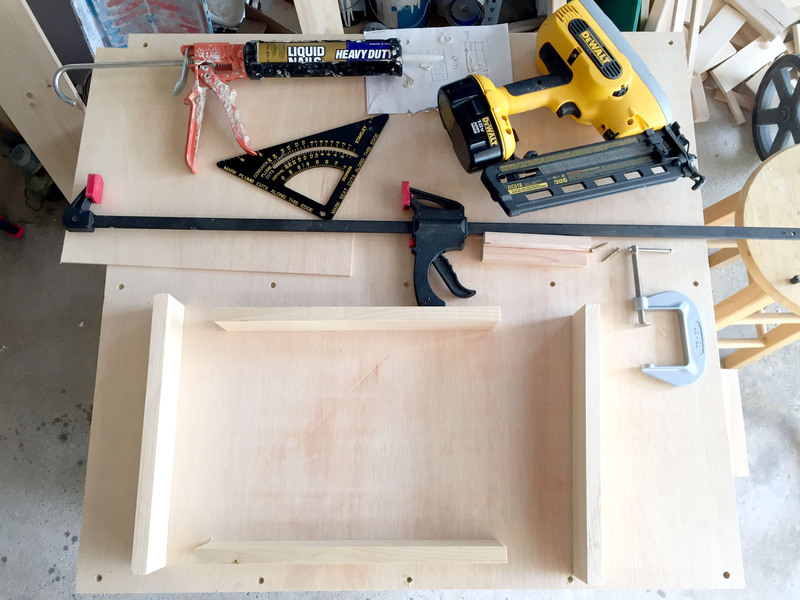 In his post Constructing a Folding Workbench with Storage, Ash shares his plans (it’s an Ash original!) and explains not only this thought process, but all the necessary steps for you to build your own. It only took two days, and Ash has been reaping its benefits ever since! Ash and I are a little storage-obsessed. I’ll admit that I have a little Christmas stuff addiction, although I won’t even admit how many trees I have. And, Ash, well he never throws anything away. In his defense, he creates some really cool things from his hoard collection – including a built-in pantry shelf made from a CD shelf. Thus, we could never have too much storage. ​In our garage, we had a 20-foot corner of space between the wall and the fridge, and Ash turned this into 70 feet of space with stacked, slide-out storage shelves. These shelves are awesome, storing some of our holiday decorations. The slide-out feature provides easy access to boxes in the back, along with easy steps up to the top. Not to mention, Ash created bonus shelving with the leftover wood. If you love storage space as much as we do, check out Creating More Garage Storage. 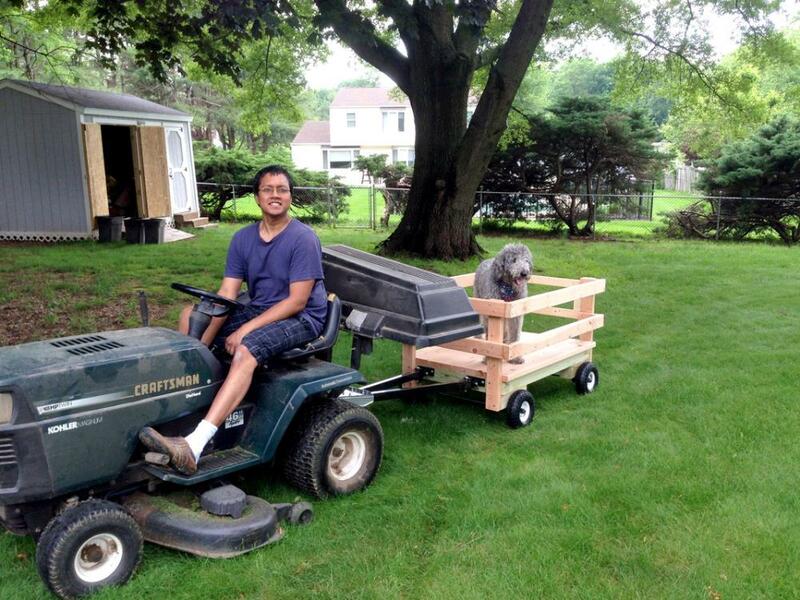 Inspired by a trip to the strawberry fields, Ash had his mind set on building a trailer for his riding mower. He figured he could haul yard waste to the curb more easily and even take the family on a few tractor rides. His vision became a reality with this custom-built wagon. Ash gives all the details, from basic construction to assembling the axles to hooking up the hitch connection in his post How to Build a Wagon for a Riding Mower. After using it all summer, Ash found it more helpful than he originally thought, and he’ll continue to use it this fall bagging up all of the leaves. Thinking about tackling a wooden pathway project? It’s easier than you think. 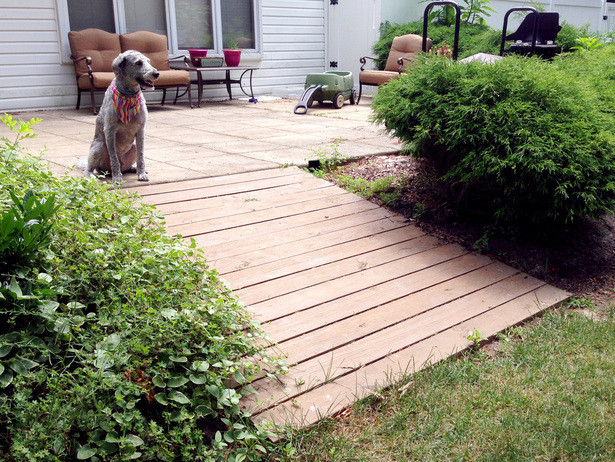 With just a few hours of work, Ash created a perfect path from our patio into the backyard. Prior to this boardwalk, there was a narrow pathway with a few uneven rocks, so this was quite an upgrade. It took a little digging, but it was completed in a just a weekend – making it a perfect weekend DIY project. All of these weekend DIY projects were tackled in just one weekend. When we were getting our yard ready for spring, we took a trip to our local landscaping center to look at their plants. I nodded, thinking about all of the creative things Eileen and our son do in our yard, like having backyard picnics, bubble-making, and painting. Having a DIY picnic table in the middle of the backyard would be perfect. Plus, I’m always up for a good woodworking project. I did some research online for how to build a picnic table and ended up choosing the first one that came up – PopularMechanics.com. It seemed simple to construct and the design plans were of a high caliber. The best part was that this picnic table plan called for using composite decking for the tabletop and seats. This eliminated any concerns I had about having to use pressure-treated wood in close proximity to foods, or having to spend time staining or sealing the surface of the DIY picnic table. Cleaning the composite decking on the picnic table would be a cinch too. It was a little more expensive than using real wood, but it was worth it. The rest of the wooden picnic table (legs and supports) would be regular pressure-treated wood, so costs would still be low overall. The specifics of how to build a picnic table is outlined pretty well in the source website, so I’ll just recap my picnic table building experience. Overall, it was quite a fun project to work on, and best of all, I accomplished it all on a Saturday (albeit a long Saturday from morning to night). I printed out the materials list from the website, and then I placed order on Lowes’ website for in-store pickup. I normally don’t like doing store pickup for lumber because you are at the mercy of whatever employee is selecting your wood. This usually means a random assortment of quality, with crowning knotty boards. However, I found an awesome deal on eBay for multiple $15 off $50 Lowes coupons, and they were valid online only. Using an Excel spreadsheet, I distributed all the materials across 4 separate orders to total just over $50 each. ​Then I purchased 4 of the coupons on eBay for a mere $4 (coupon codes were emailed to me immediately after purchase) and placed four Lowes store pickup orders. Just $4 on eBay saved me $60. Not bad! The Lowes guys didn’t mind when I went to pick up the order either. I did have to get some wood cut in the store for the picnic table. I ordered several 12 ft pieces of composite decking and I knew that wouldn’t fit in my car. So I had an employee cut them in half for me. Having the store cut your wood is convenient, but it’s not always worth it. Their cuts aren’t that accurate, and sometimes you have to wait a while to get help. Additionally, there seems to be a trend starting in stores to charge you for too many cuts. Always thinking of how I can save money, I brought a measuring tape and a handsaw in case I decided to cut the picnic table wood myself in the parking lot. As it turned out, a thunderstorm appeared out of the blue when I got to Lowes, so that forced my hand and I had to have them cut it for me. They usually charge 75 cents for the cuts, but they waived it. The first step in my how to build a picnic table project was to cut all the wood. So when I got home, I spent an hour cutting all the wood according to the plans. This hard work resulted in the picture below. ​Doesn’t it look like a kit just waiting to be put together? Finally, the crowning moment of the project came when I attached the composite decking on the DIY picnic table. I highly recommend using a countersinking bit for pre-drilling the holes for the deck. 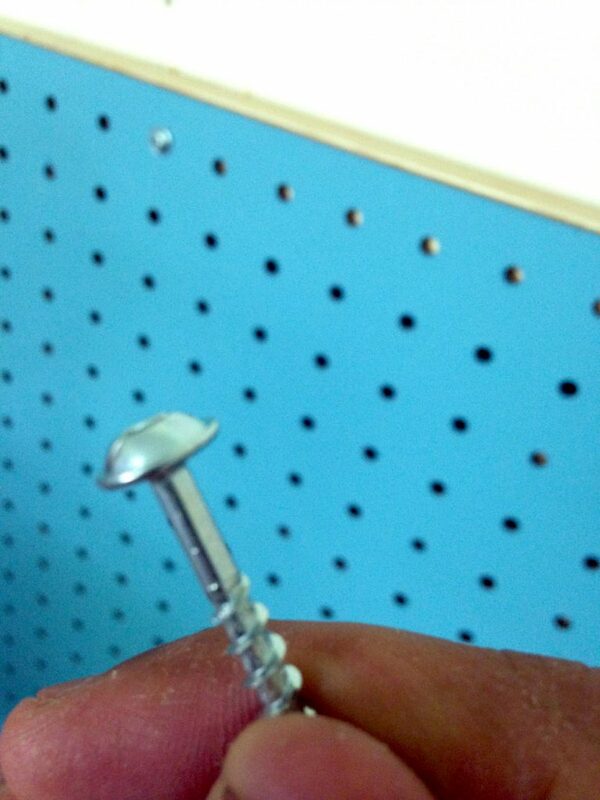 I believe they make special screws for composite wood, but I didn’t have any. At first, I used regular deck screws, and without a countersink bit, they did not look good after the head penetrated the wood. Unlike real wood that compresses under the screw head, the composite material made a really ugly blemish on the surface. ​After trial and error, I found the countersink bit did a wonderful job carving out a notch for the screws. Finally I completed the DIY picnic table. Eileen helped me move it into the backyard. It was extremely heavy, but that was just a testament to its quality. Here’s what the picnic table looks like in its element (notice our garden planter and rain barrel in the background). The total cost of this professional quality DIY picnic table ran us $140, but that’s after a $60 discount via the $4 eBay coupons. I estimate a pre-built picnic table of this quality would have cost a few hundred dollars in the store and even more at the landscaping stores! Our DIY picnic table is already getting a lot of use and is sure to be a hit at our next BBQ. Years ago, I painted an old dresser white with turquoise knobs. It looked really cute, but it was apparent that it was painted – the surface wasn’t anywhere near the quality of the furniture you would buy from the store. 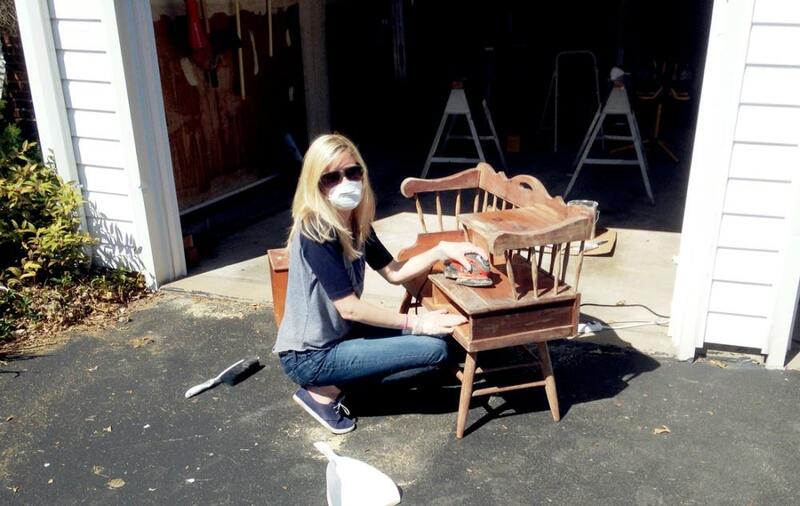 There are so many tutorials online about painting furniture, and so many say that you can skip sanding or priming. 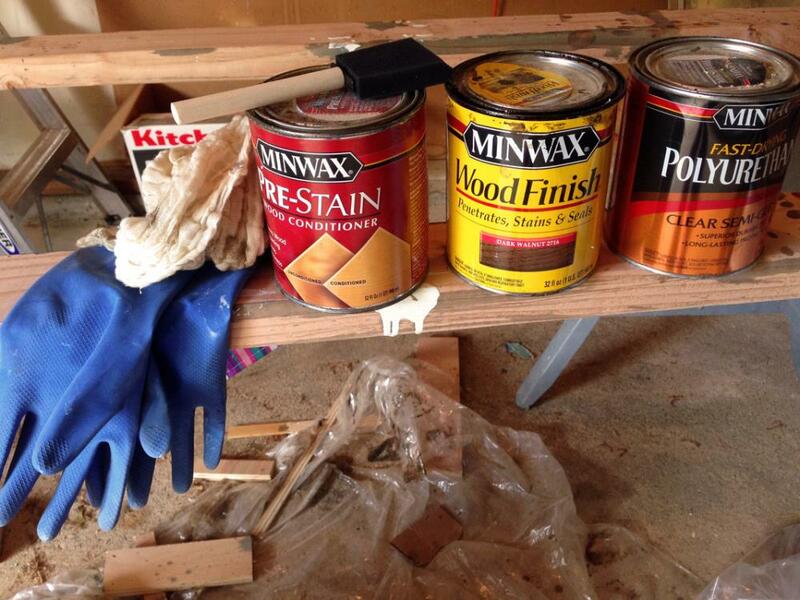 Here’s my advice – don’t skip sanding, don’t skip priming, and use a high-quality paint. Lately, I had been in the market for a new desk in my craft room. I was determined to find a good deal on an old wooden piece and then figure out how to paint the desk like a professional would. You see, my current desk was an old kitchen table. Ash was in the process of updating my craft room with beautiful built-in bookshelves and a window seat, so it was time for my kitchen table-desk to get the boot. 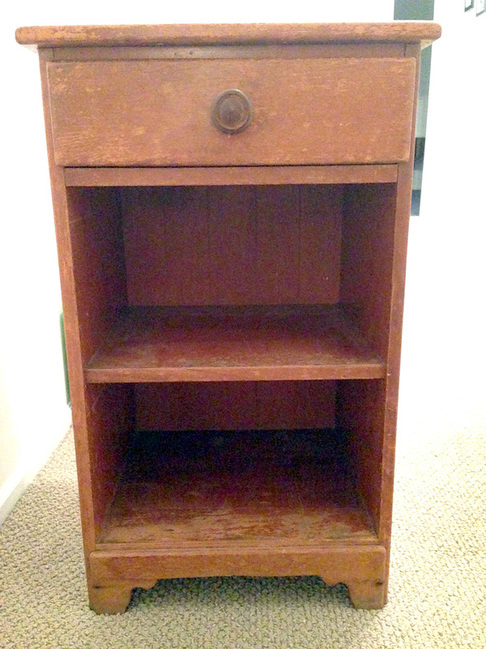 I didn’t want to pay $200 for a new, modern-looking desk, so I scoured a few flea markets and thrift stores. Finally, at a Habitat for Humanity thrift store. I found a brown wooden desk that I could work with. It was originally $40, but with a 50% coupon – I paid $20. Being that my craft room would have mostly white furniture, I decided to try my hand at learning how to paint a desk like a professional. Below is a picture from before I started painting the wooden desk. Before painting the desk, the first thing I did was remove the drawers and knobs. Then I cleaned the desk really well – wiping off dust and anything else that had collected on the surface. The next step of the desk makeover was sanding it down. To sand, I used a random orbital sander with 80-grit paper. This got the desk down to the bare wood quickly. However, even though the desk was smooth to the touch, I probably should have gone over it with 220 grit paper afterward for a more fine finish. Here is the desk after the sanding and before painting. Notice I put the feet of desk on pieces of wood to raise it up, so I could easily sand, prime, and paint the desk’s legs. After I was finished sanding, I wiped the desk down again to get all of the sawdust off. You can use a cheese cloth for this or even paper towels. Next, I was ready for the primer. I had a 2-gallon bucket of indoor/outdoor primer leftover from painting the shed last summer, so I was all ready to go. I used a large roller brush for the desktop. Then I used a small roller brush and a 1-inch brush for corners and tight areas. In addition, I used an 1-inch foam brush for the rungs. 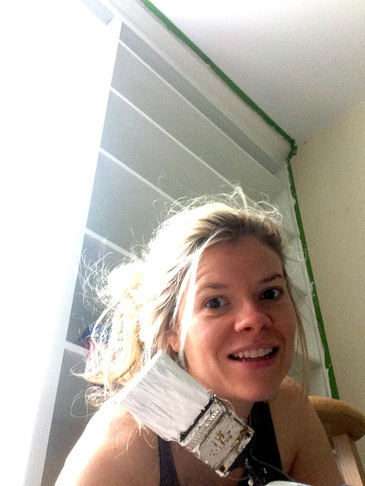 If you are wondering what the most challenging part of how to paint a desk is – it was painting the rungs. The rungs on this desk were in such close proximity to each other. As soon as I would paint one side of the rung, paint would build-up on the bordering sides. I would then smooth this, and once again, the bordering sides would have some build-up, continuing the cycle. Thus, I had to very meticulously spend time painting the desk rungs, being careful not to use too much paint and being conscientious about going around and around to smooth everything. If your furniture has a design like this, be sure to leave lots of time (and have plenty of patience). Also, since the foam brush put on such a light coat of primer, I knew I would have to do at least two coats on the rungs of the desk I was painting. After two coats of primer on most of the surfaces (I did 3 on the top of the desk as well as the rungs), I was happy with the results and continued on to painting. After priming, I was ready to start painting. I was already happy with how the white primer was looking and was excited to finish up the project. For this, I used a high-quality enamel paint (urethane acrylic satin). This type of paint differs from regular paint in that the paint pigments are floating in a urethane solution so it dries to form a very hard, protective surface – much like how polyurethane dries. To apply this special paint on the desk, I used a foam roller brush. It is recommended to use a foam brush with this type of paint to give it a smooth finish. If you use a regular nap roller (like the ones you use when painting walls), it will soak up and waste a lot of the paint, and it leaves a textured finish. In addition to the foam roller brush, I also used a 1-inch foam brush for the rungs and tight areas. I applied a thick topcoat on all of the surfaces of the desk, taking my time with the rungs. After it dried, I put a second coat on the top of the desk only. This provided extra protection on this surface since it would get a lot of wear and tear. Also, this probably goes without saying, but if it’s a windy day, paint your furniture in the garage if you can, so particles don’t blow and stick to your piece. The surface of the painted desk had a nice protective enamel that made it easy to wipe, and it looked professional painted. However, the painted desk still looked like there were ridges in the wood; it wasn’t a sleek, smooth finish like the brand-new furniture you buy directly from the store. Don’t get me wrong, I was still very happy with the way the wooden desk turned out. However, in hindsight, when I sanded the desk down to the bare wood (even though the wood felt smooth to the touch), I probably should have gone over it with 220 grit paper for a more fine surface. The 80-grit paper quickly got the old finish off, but the 220 would have given it a smoother seal. I still loved the way the painted looked – it was a welcome addition to our bright, airy craft room, and I learned exactly how to paint a desk. 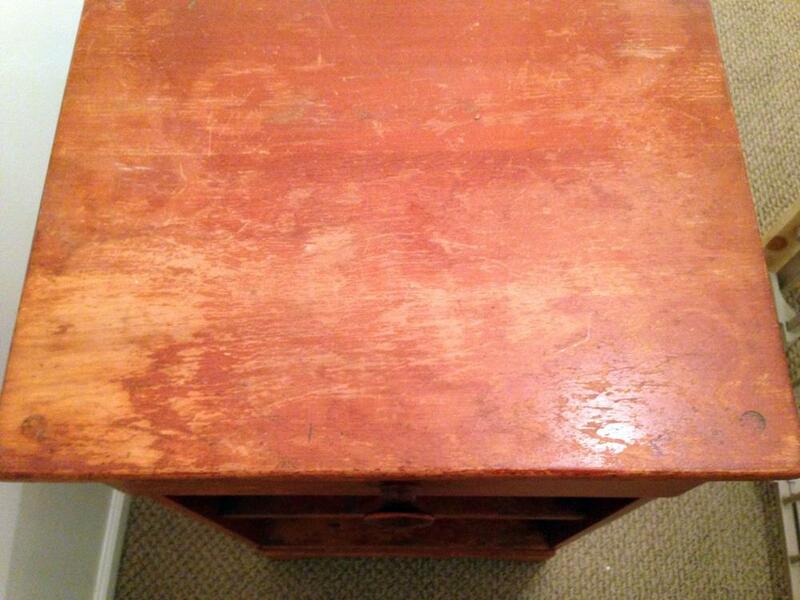 ​​Here’s a side-by-side view of the before and after pictures of how to paint a desk. Not bad, right?! The time span of painting the desk was the course of a week – including dry time and airing out time. The paint fumes were not strong, but a little extra time never hurts. ​The total cost came to $70. The desk was $20, and the paint was $50. We had previously purchased the primer and the painting materials, so that wasn’t a cost for us. ​And, there was primer and paint leftover for the next project 🙂 If you are wondering how to paint a desk like professional, these tips and tricks should definitely set you on your way, keeping you loving your professional-looking piece for longer. With the warm weather, Ash and I have been working on so many projects – a built-in bookshelf in our sitting room, a planter box for our garden, painting an old thrift store desk, transforming a kitchen desk area to a cabinet, and refinishing an old telephone table. 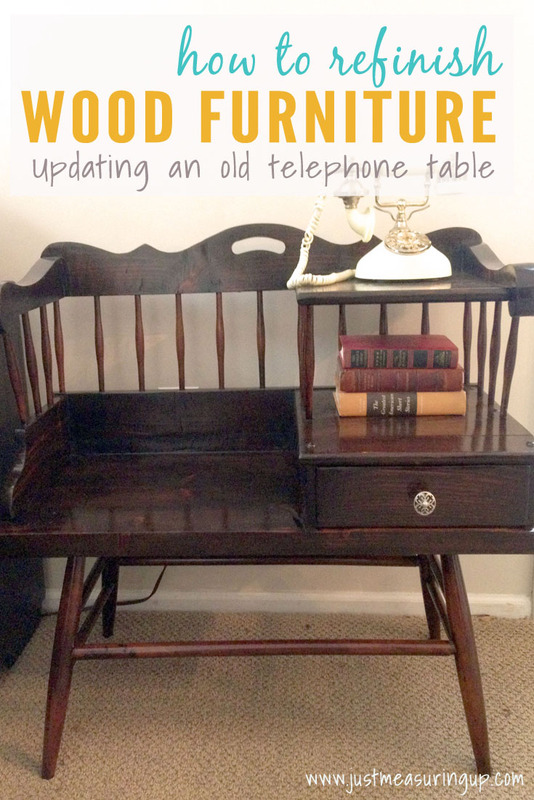 Today I’m sharing how Ash and I refinished our old telephone table. I found it for $20 at my favorite flea market years ago and feel in love with its charm. I’d been wanting to stain it dark for years, but it fit in pretty nicely at our old house. 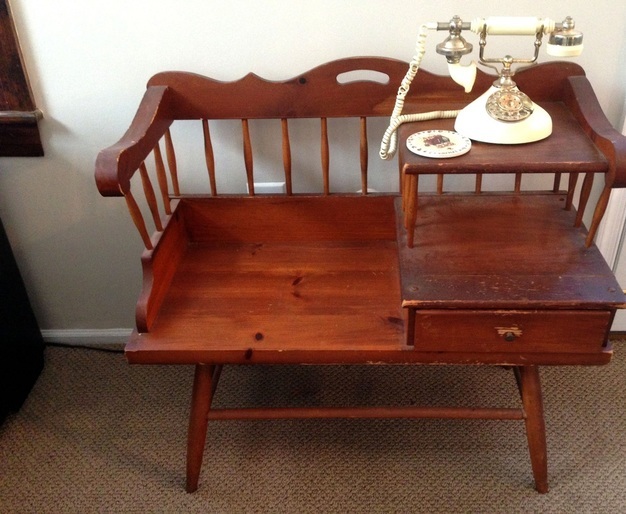 However, in our new house, our family room is much more modern looking, and this old telephone table stood out like a sore thumb! 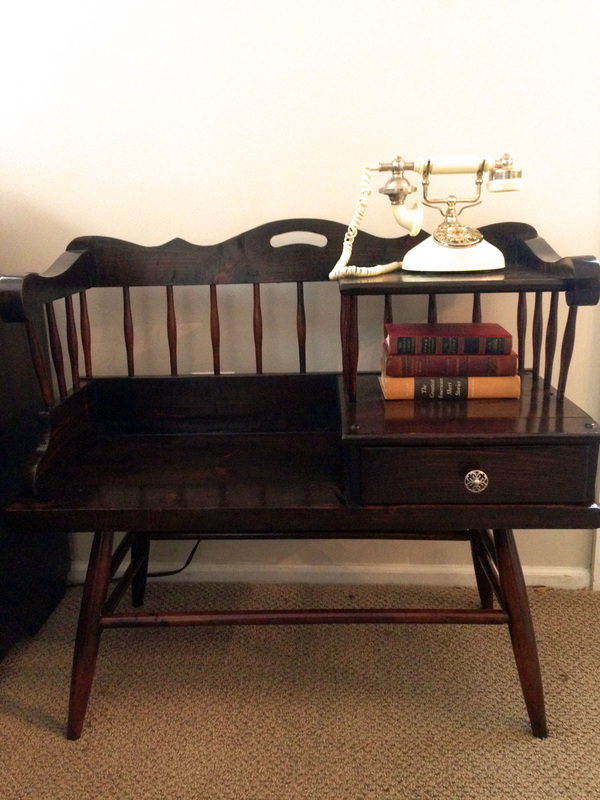 I was excited to finally have a chance to redo this old telephone table. My plan was to use wood stain, as we redid my nanny’s coffee table years ago with wood stain. It turned out beautiful. The first thing I did was wipe it down really well, getting rid of any dust. Then I started to sand down table. Here’s where I made my mistake. I didn’t sand it down to bare wood. I just did a light sanding, enough to give the stain something to stick too. Mistakenly, I then moved onto staining the piece, and it was turning out horribly. Since I didn’t sand this old, weathered piece down to bare, there were lots of little knicks and grooves in the surfaces. The stain was filling these in, turning them almost black. So, the surfaces were looking spotty and uneven. I figured that I now had three choices: I could switch gears and use gel stain like I did on the kitchen and bathroom cabinets, I could paint the table, or I could start over again and sand it down to bare wood. I decided to sand it down to bare wood and start again. Here’s where Ash helped me. We decided to leave the rungs as is – they looked fine with the first coat of stain, and we were hoping they would blend in well with the second application of stain. To begin the sanding, Ash started with the random orbital sander and 80 grit paper. However, the existing finish on the table proved to be very challenging to remove. The sander was doing its job but very slowly and burning through lots of paper. After some experimentation with different tools, Ash found the best one to be the oscillating multi-tool. Using a flush-cut saw blade, running the blade against the surface at the right angle scraped off the thick, difficult finish. It did leave behind a very ragged surface due to the oscillating action of the blade, but he sanded it down smoothly after with the orbital sander. One caution about using the oscillating multi-tool is that Ash had to be careful to pull the blade versus pushing it through. When he pushed the tool, it would sometimes snag a groove and start cutting deeply into the wood. The pulling action worked out best. I prefer to stain wood using rags because the stain rubs into the wood better. You have less excess and build-up; however, I keep the foam brush around for hard to get to places. Also, I grabbed our can of pre-stain since the wood was now bare. I used the pre-stain first, brushing it on with a foam brush and waiting about 20 minutes before starting to stain. I used the first rag to rub on a nice coat of stain. Then, I started with the seat and worked my way around. Since I was working in the hot sun, the wood was absorbing the stain faster than usual. So, I needed to wipe off the excess before I finished the whole piece. I used the second rag for this, lightly brushing it along the surface. Don’t skip this step – or you will end up with globs. 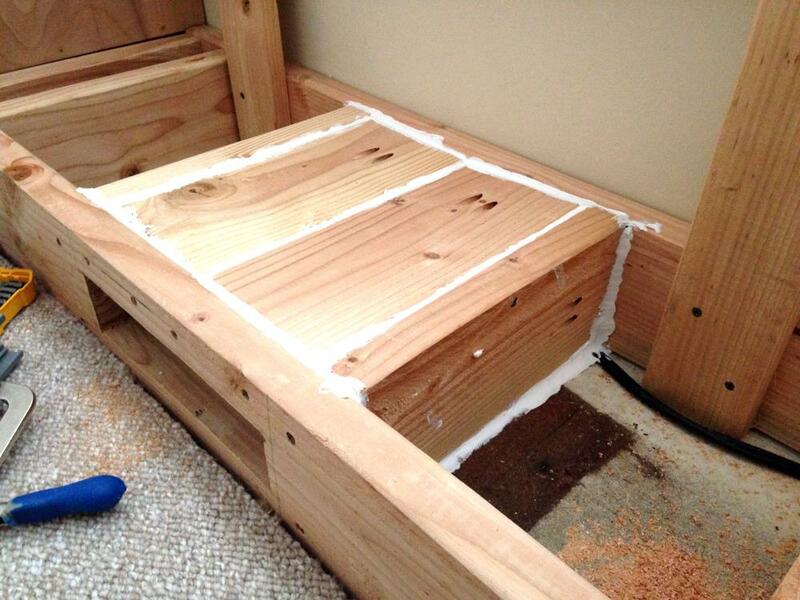 Also, make sure to do a good job removing the excess around tight areas – like where the rungs meet the table. Otherwise, you will end up with ugly, globby lumps. Even though I used the rag for most of the staining, I took out the foam brush to get the really tight corners or spaces. Be careful with the foam brush because it holds a lot of stain and drips easily and messily. After I was done staining and removing the excess, I did a quick scan to make sure I didn’t miss any drips. I let it dry until it wasn’t tacky anymore. Then, I put on another coat. After I was done with the two coats, I was pleased with the results. So, Ash put on a coat of polyurethane. He used a foam brush, going along with the grain of the wood, and carefully making sure there were no lingering air bubbles on the table’s surfaces. He let that dry overnight and then did another coat. The refinished telephone table was almost done. The last step was choosing a new knob at Home Depot and screwing it into the drawer. 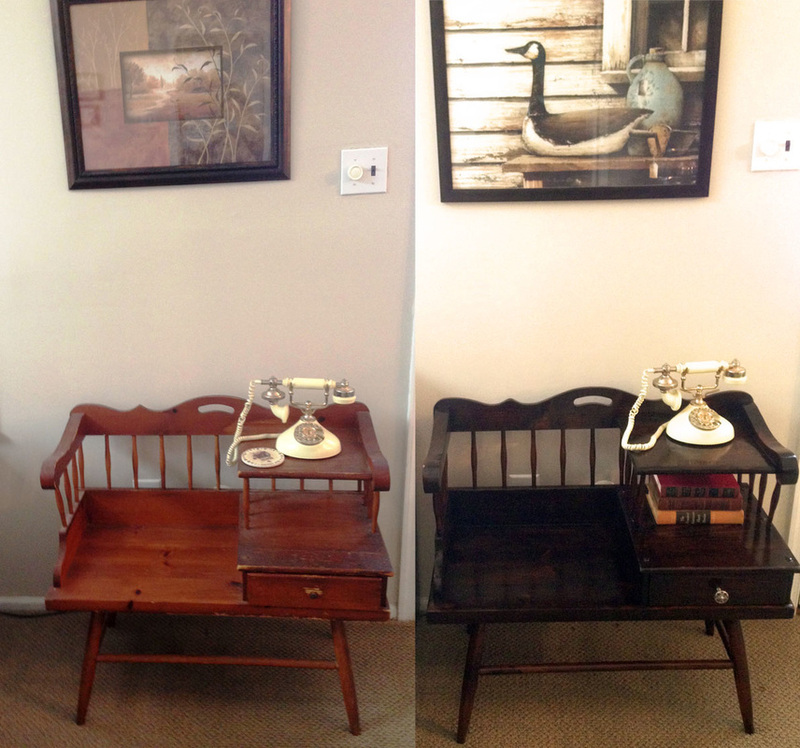 We let the refinished telephone table air out for a few days. Then, we moved it back into our family room. The time of project spanned about a week or so, due to the dry time between coats and the couple of days we let it air out. While the refinished telephone table was drying, Ash and I had other projects we were working on – like a desk update.